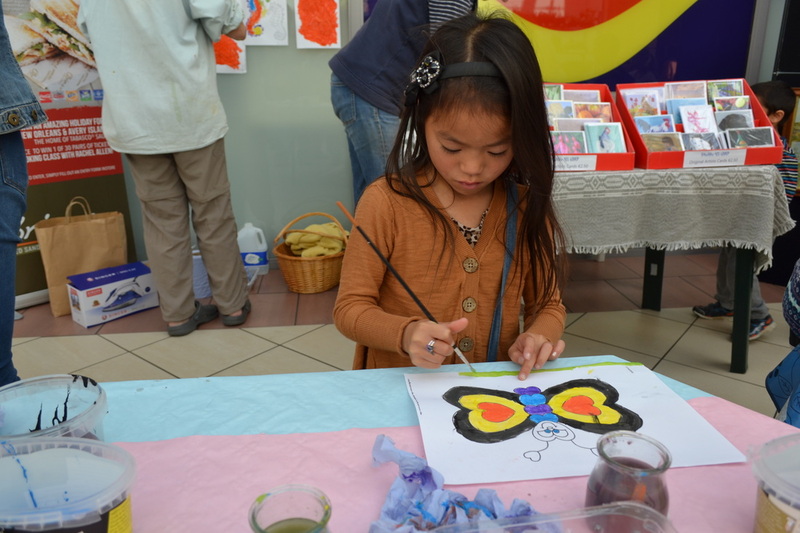 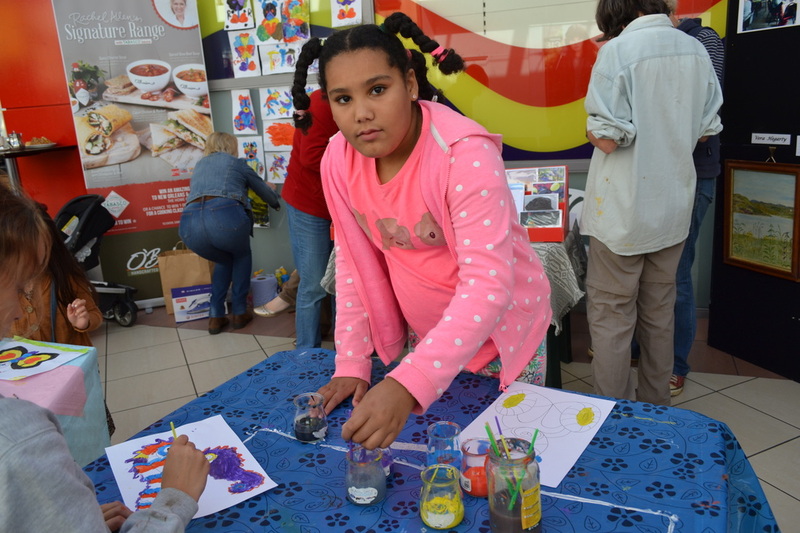 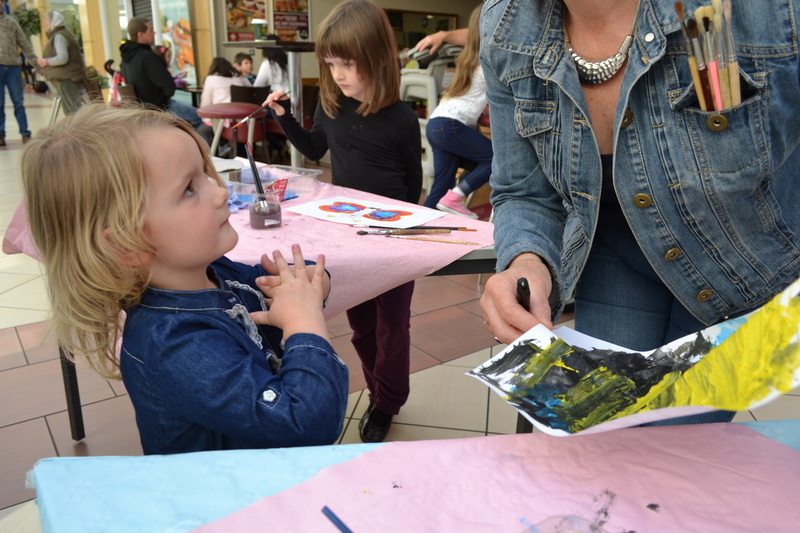 She demonstrated how to use only two colours to paint with. 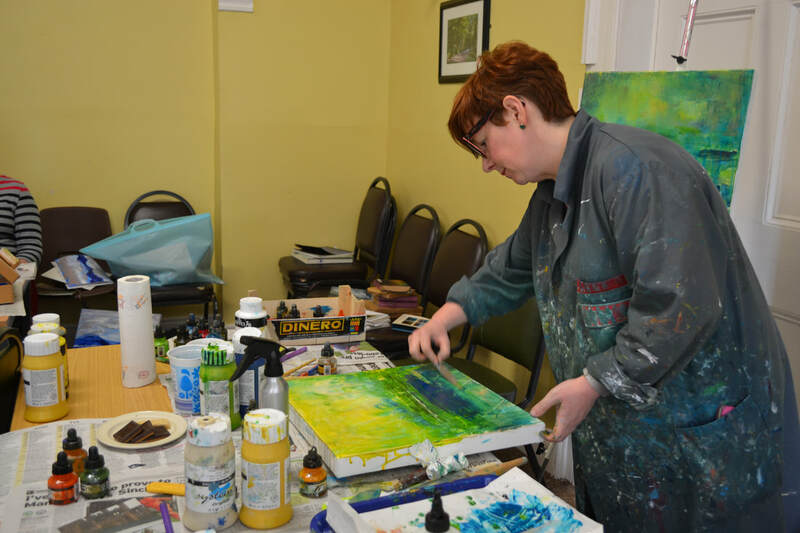 She used Red and Green for this Demo but said that you could use either Blue and Orange or Yellow and Purple, with this method it is possible not to ever get a muddy result. 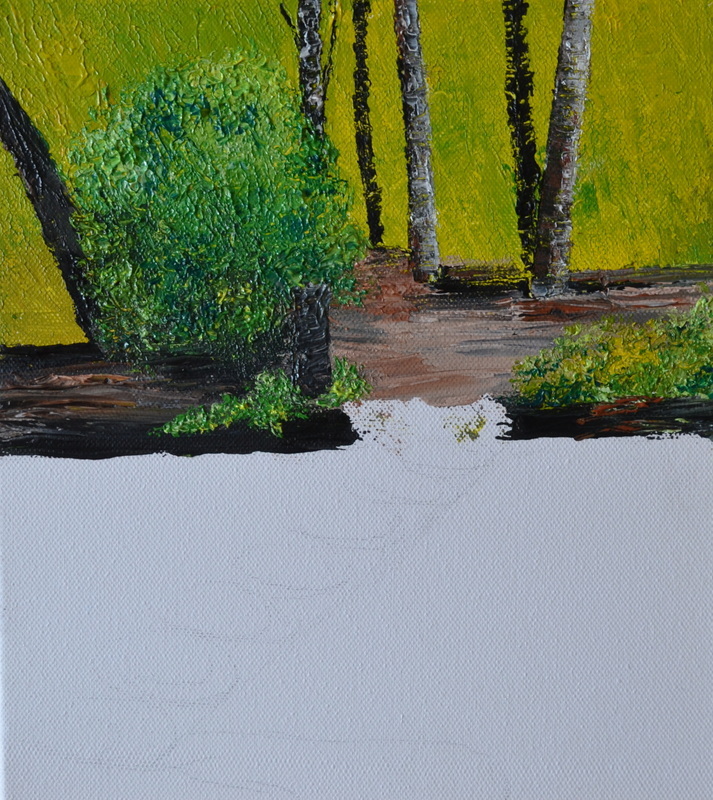 White was also used for lightening and Black in a small way too. 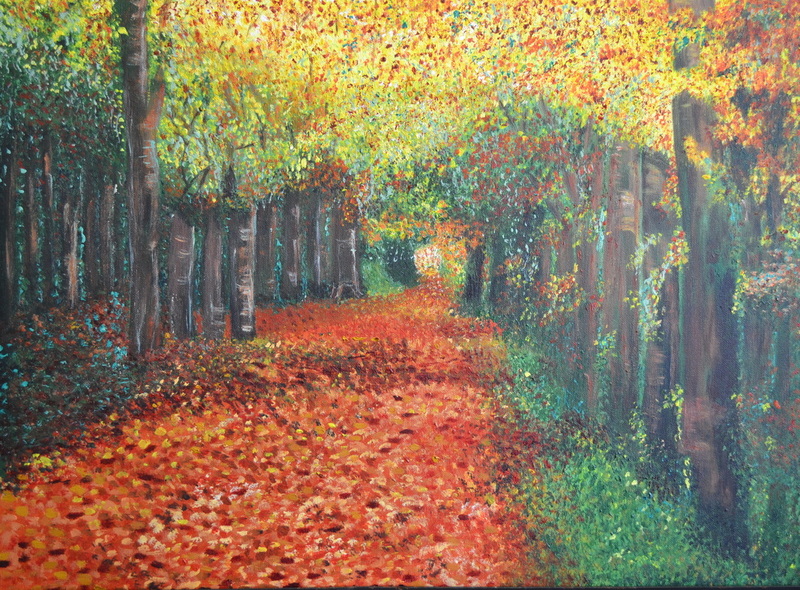 The colours used are all complimentary colours. 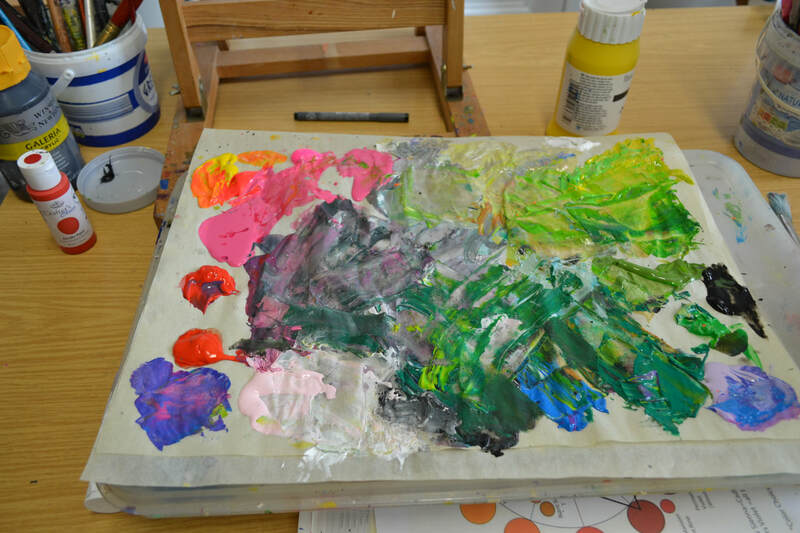 The palette below shows the different variations that she got using just these colours. 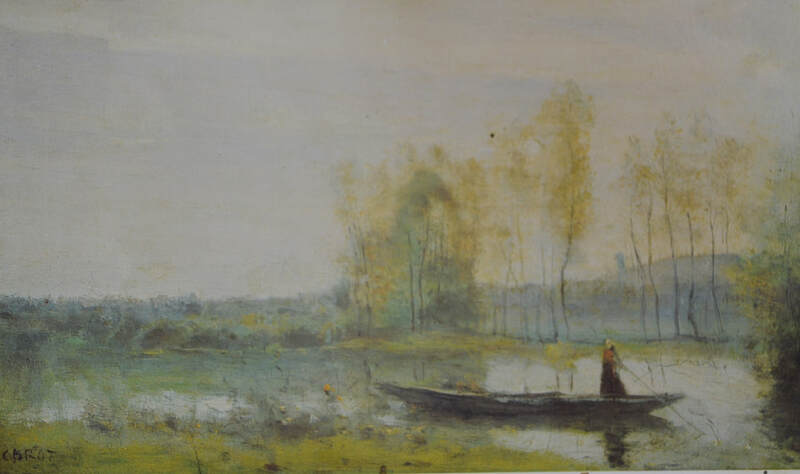 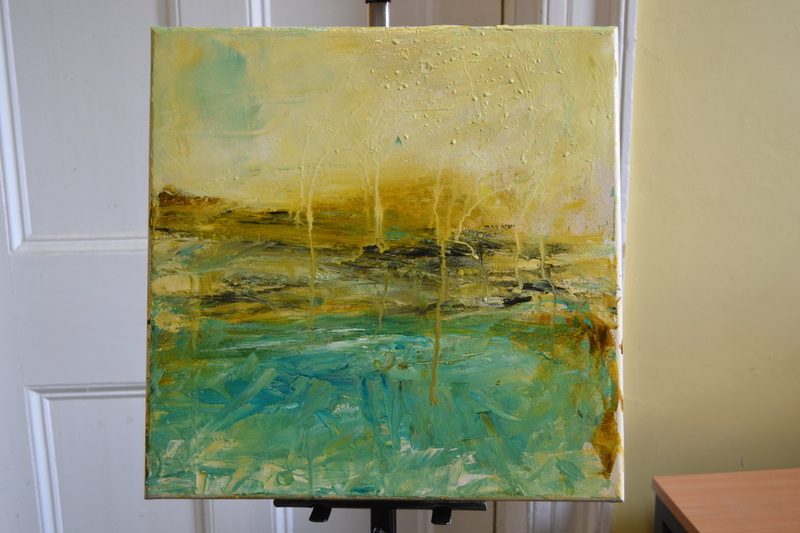 At times she used other colours like yellow but they had to be mixed with the original colour before painting on the canvas. 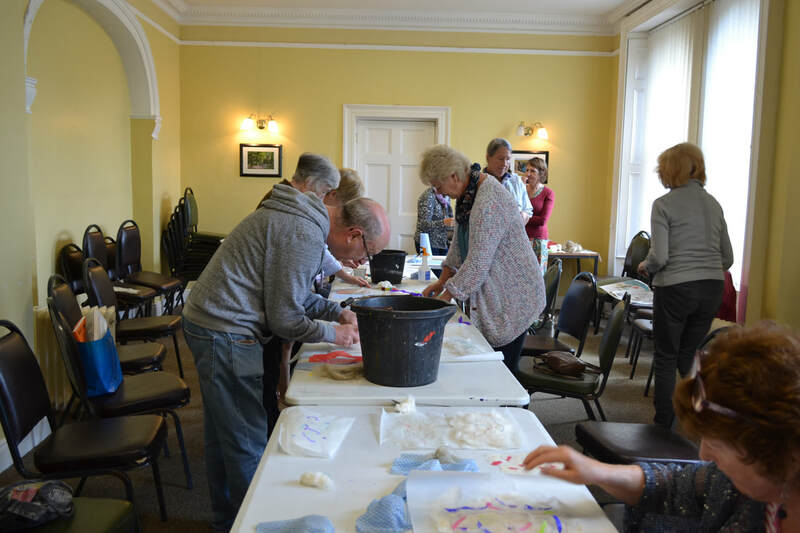 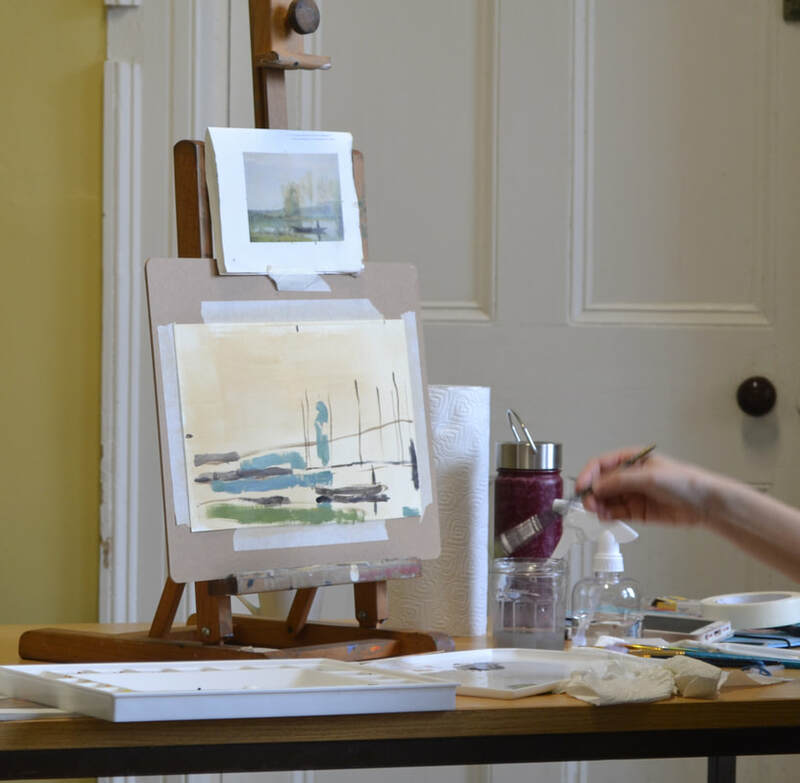 It was a very enjoyable morning and we all learnt a lot and hopefully will try to practise painting with just two complimentary colours on our next Friday painting session. 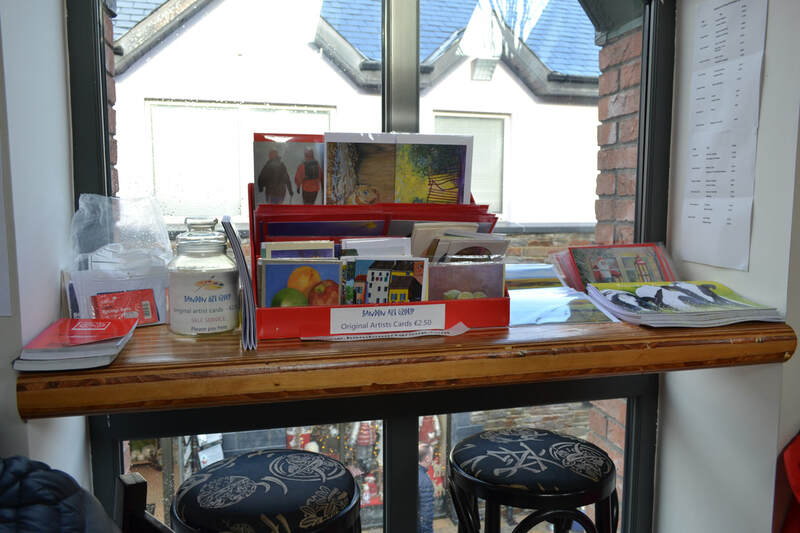 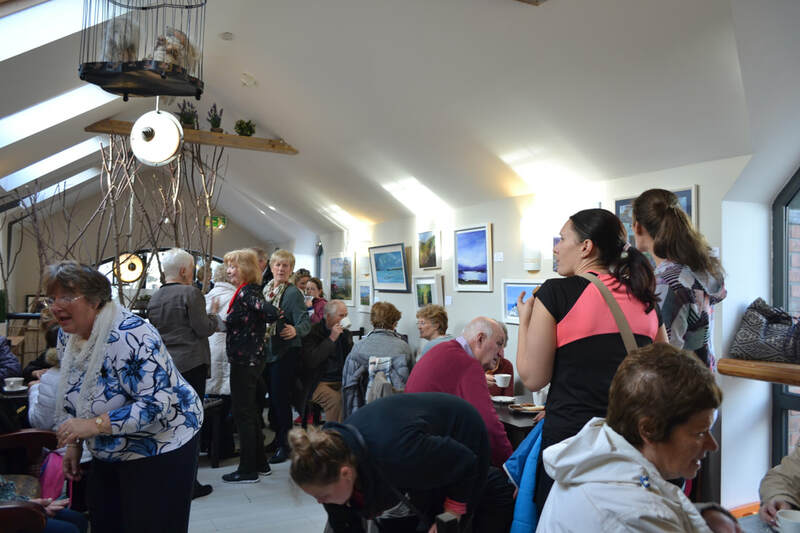 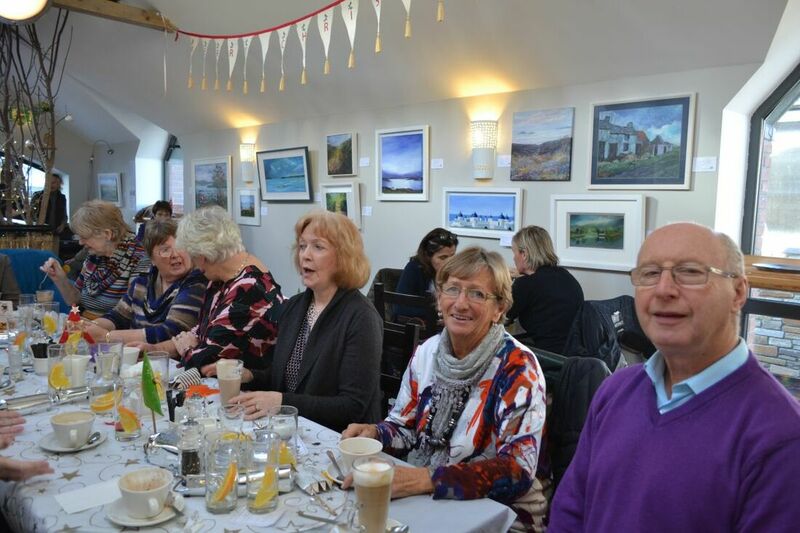 We had a very good turn out at our Annual Coffee Morning on Friday 23rd November. 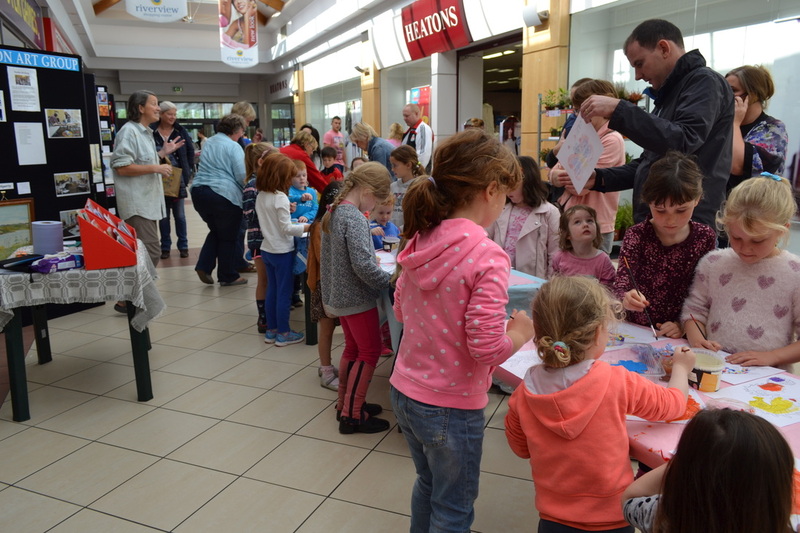 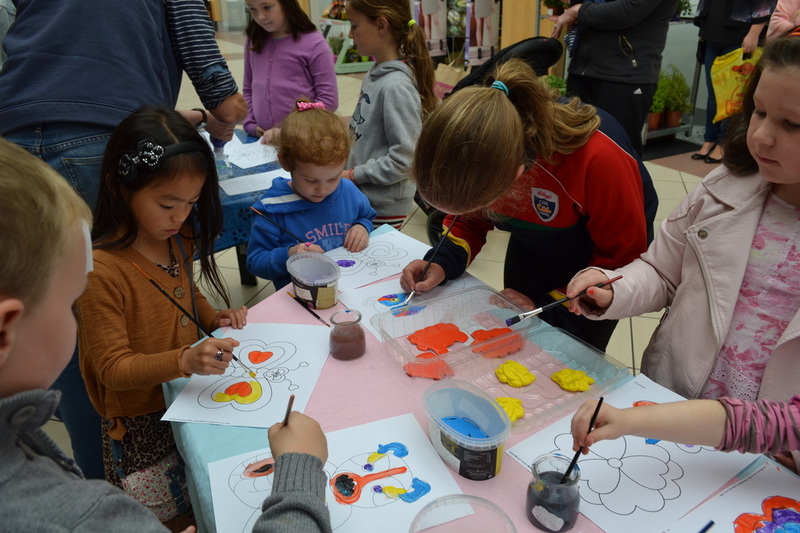 Everyone enjoyed themselves and a lot of money was raised for St. Vincent de Paul. 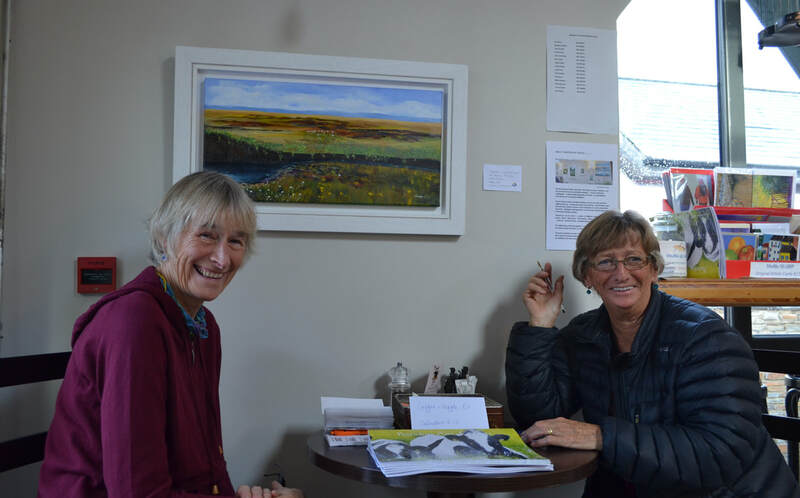 We each had a painting on display from our latest 2019 calendar along with one other painting. 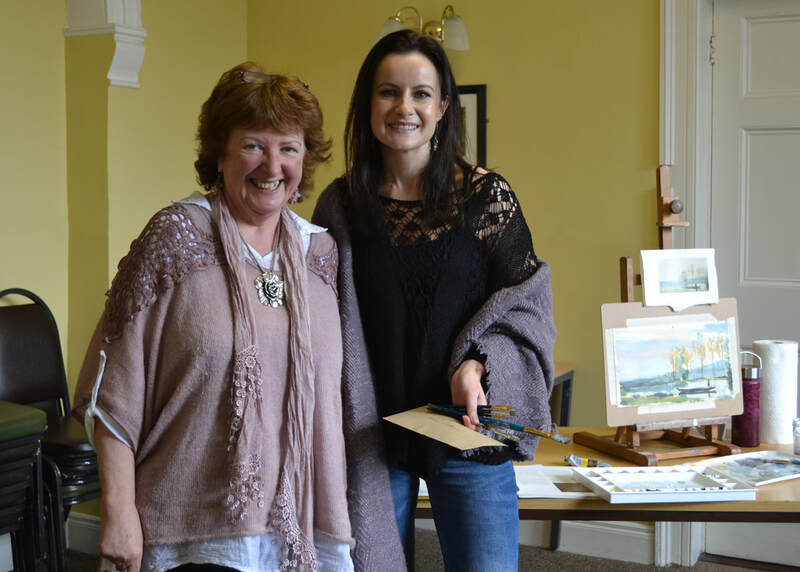 The photo above shows Marian Murphy our Chairperson thanking everyone for supporting such a good cause. 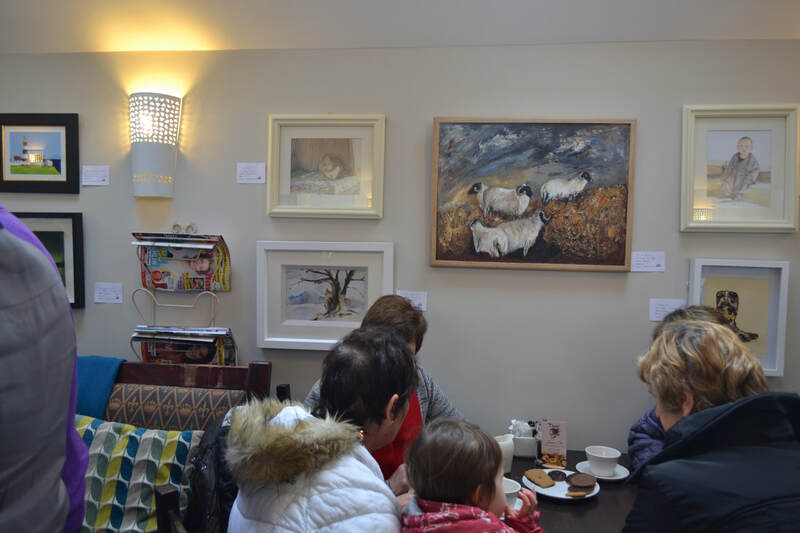 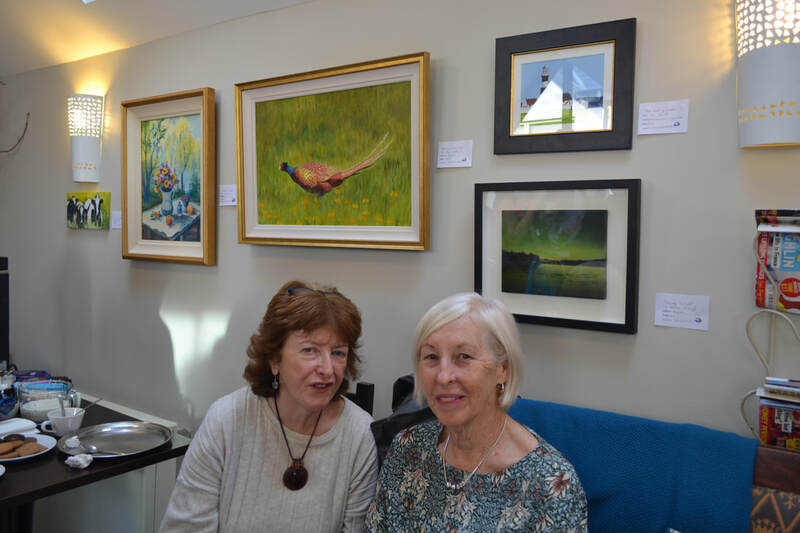 Our paintings will be on display until the 4th January. 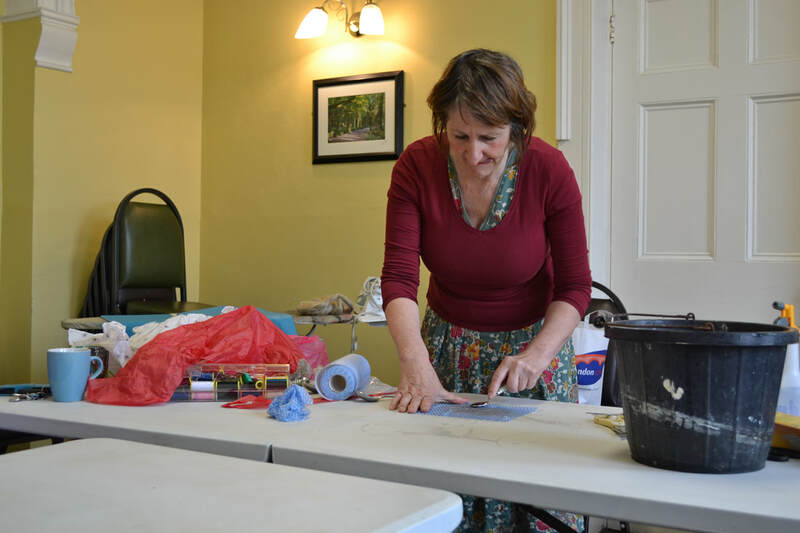 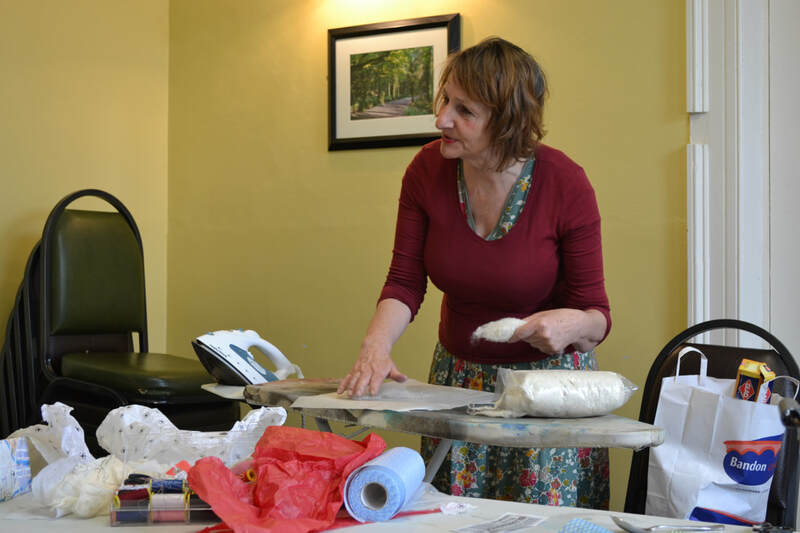 Caroline Smith did a workshop with us in May. 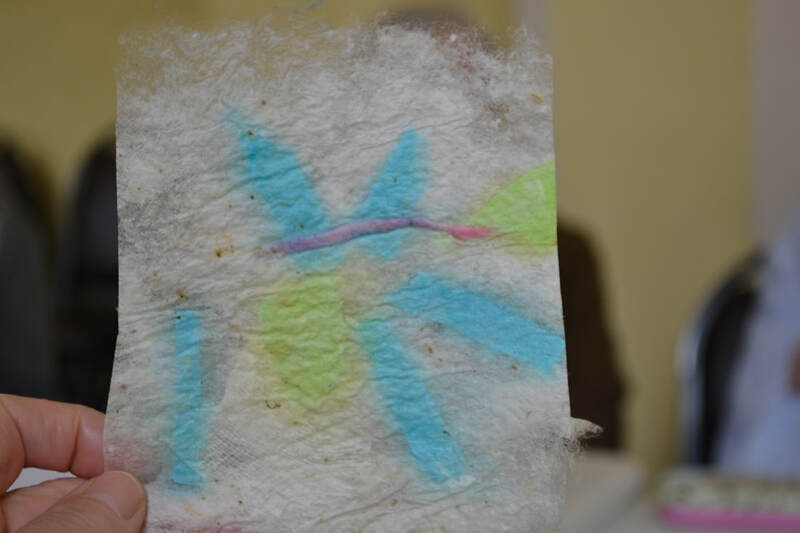 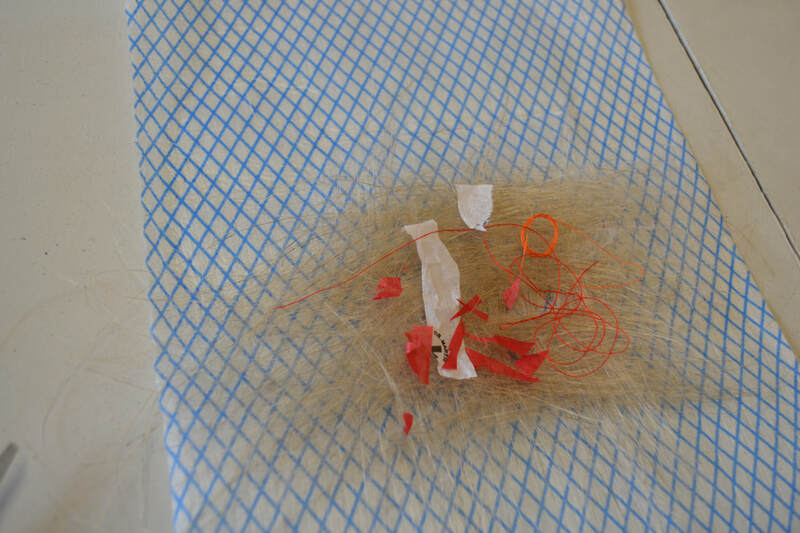 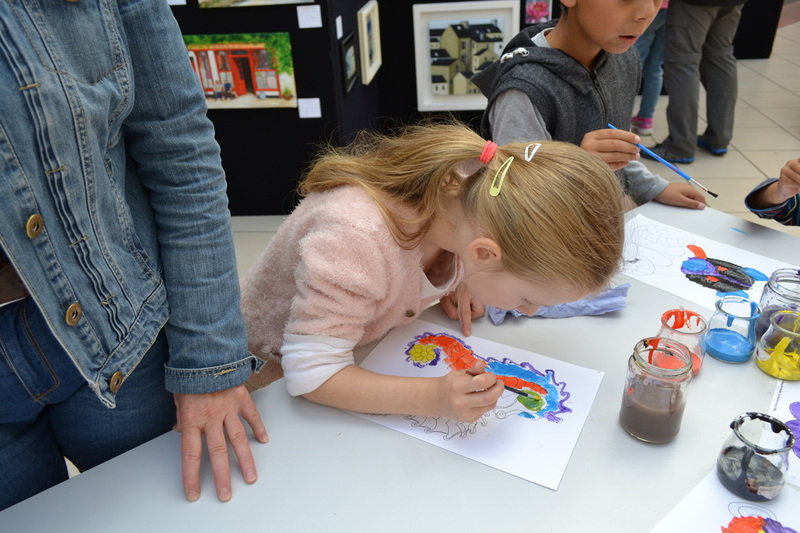 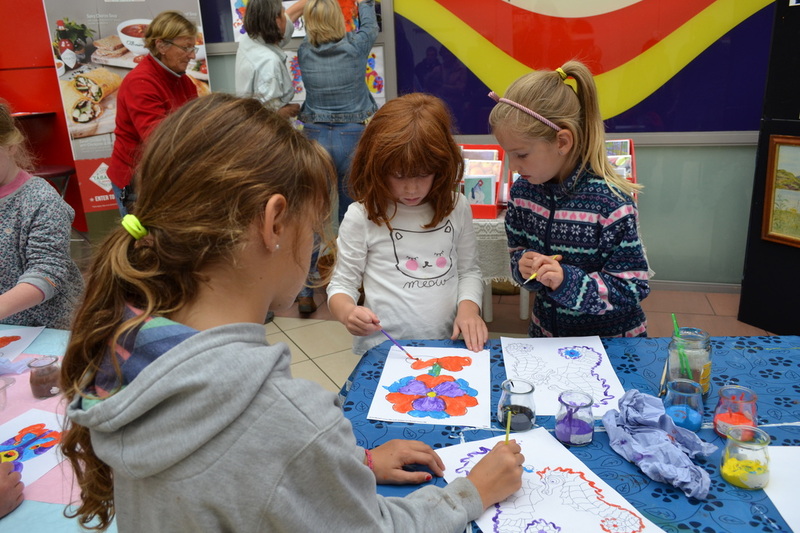 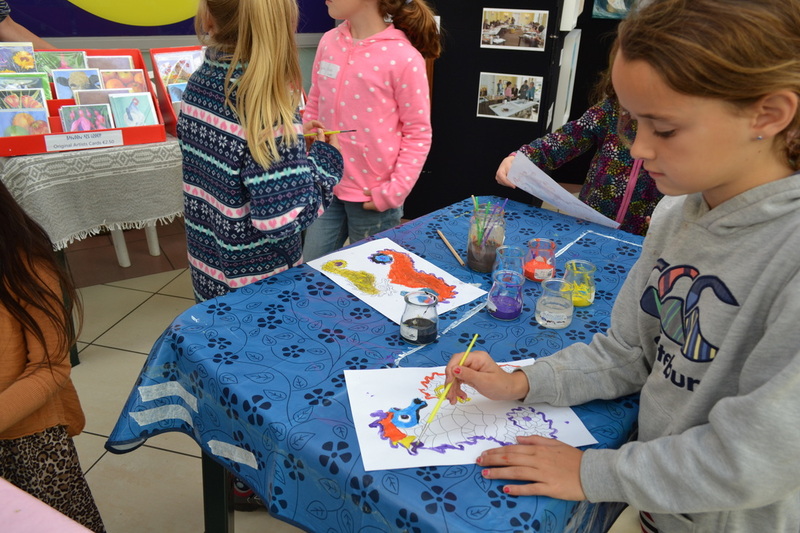 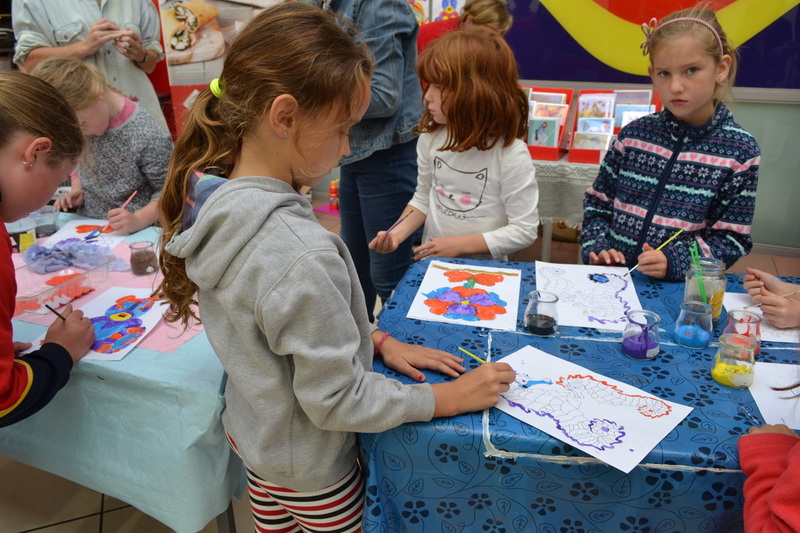 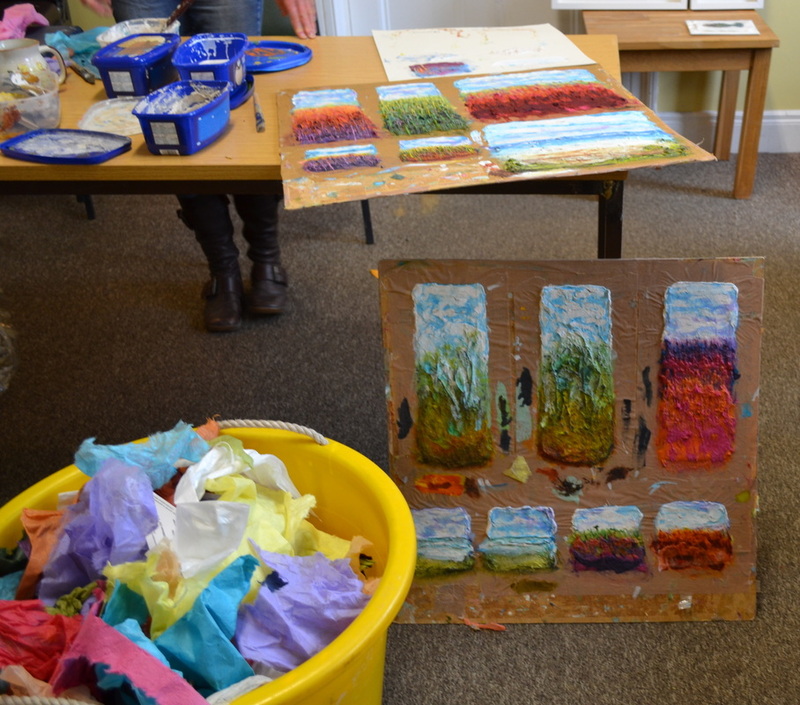 We all took part in using Flax and also Silk cocoon waste to make very interesting art. 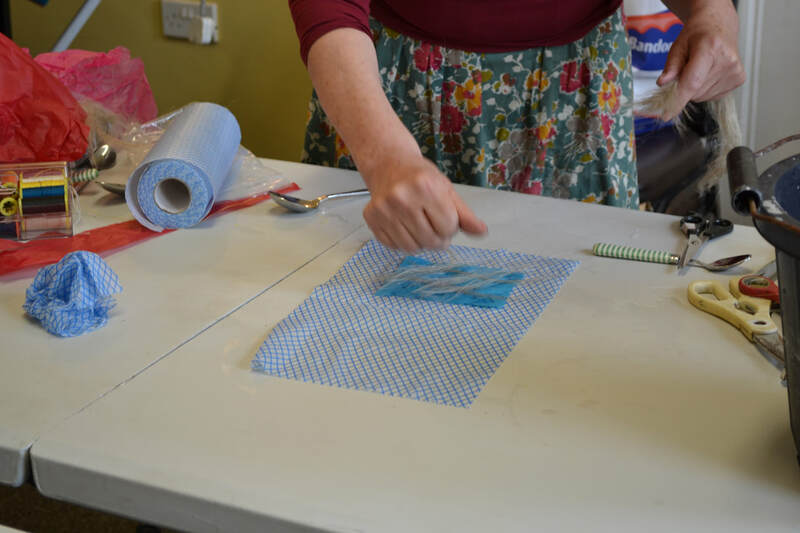 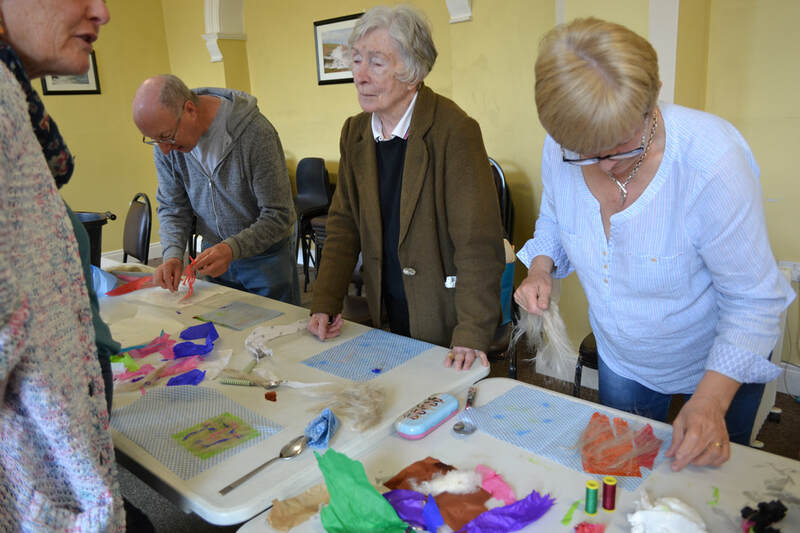 We had great fun and learnt a lot about using textiles and some of us are sure to go ahead and explore these mediums more in the future. 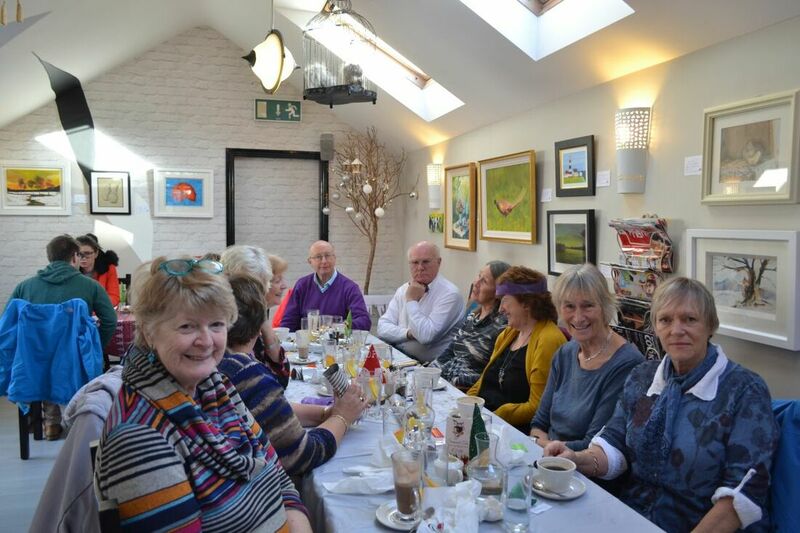 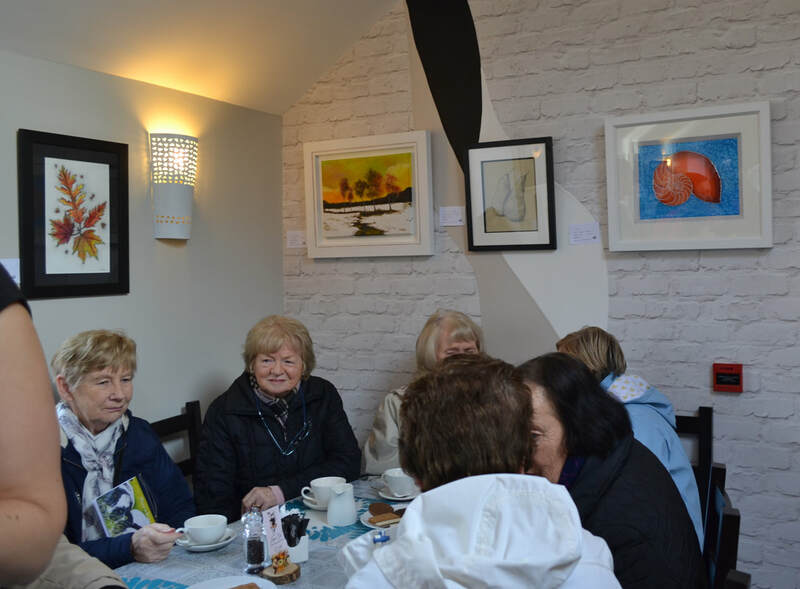 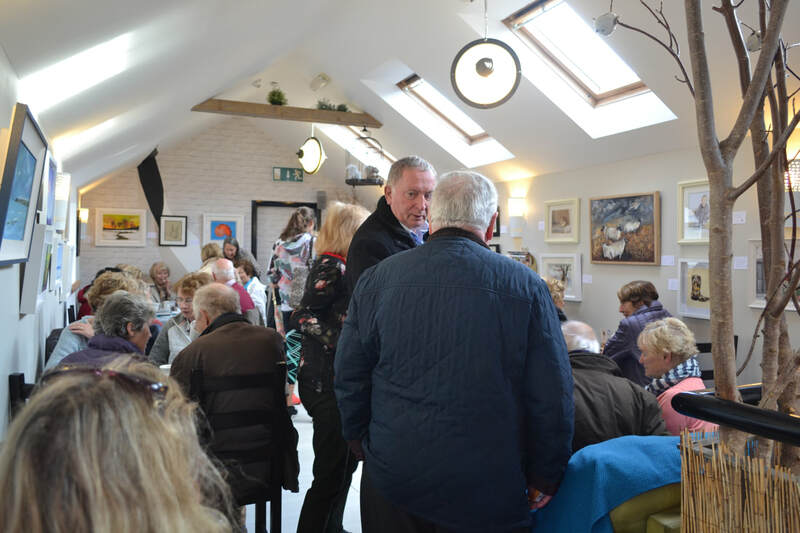 More festive cheer at the Bandon Art Group 2018 Christmas lunch! 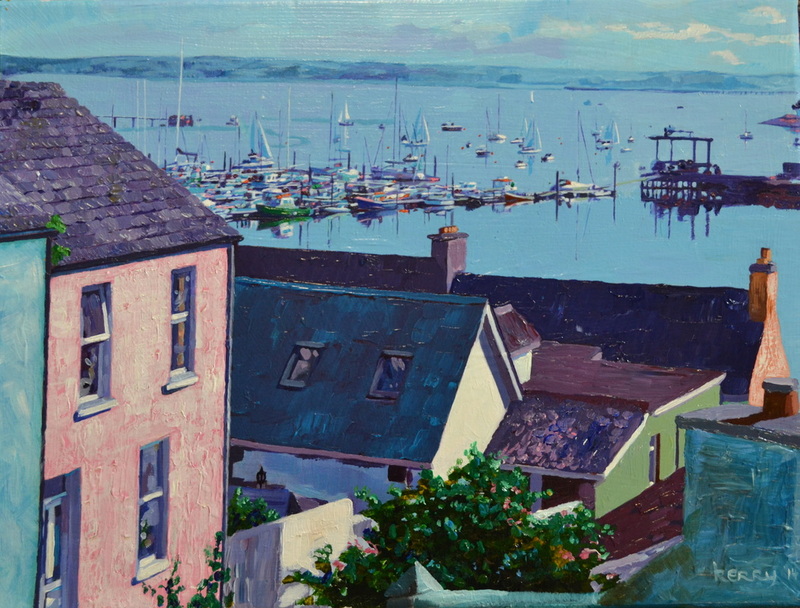 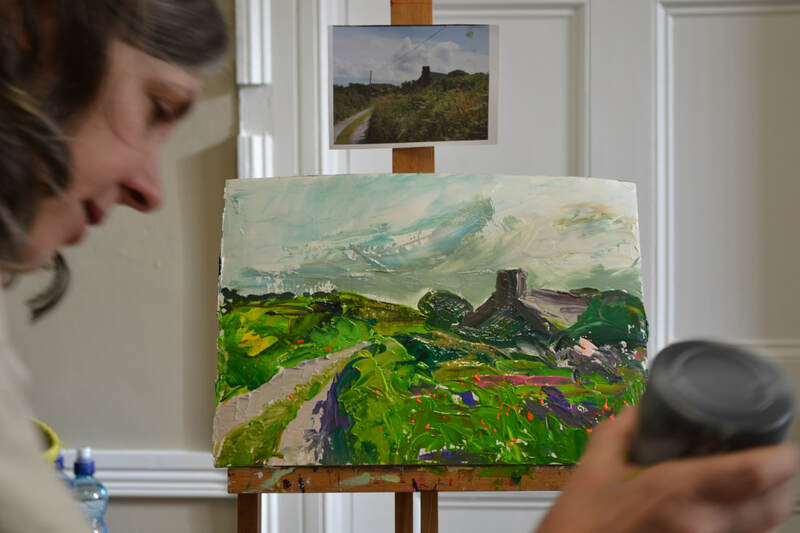 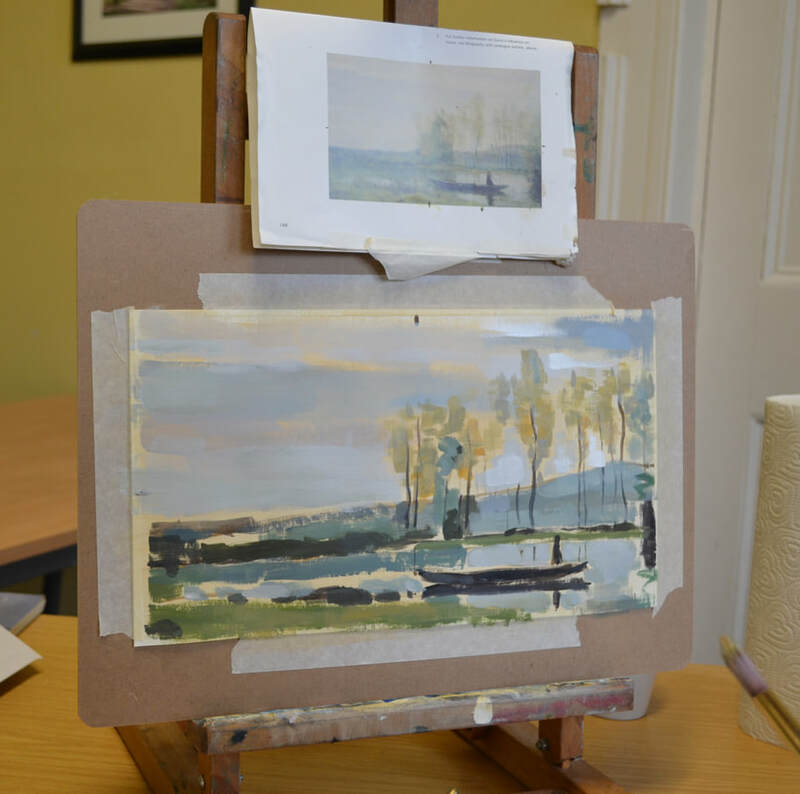 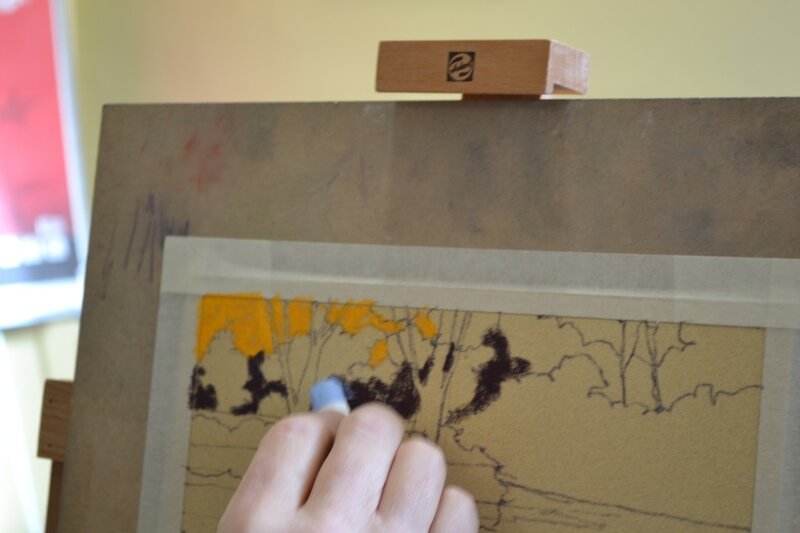 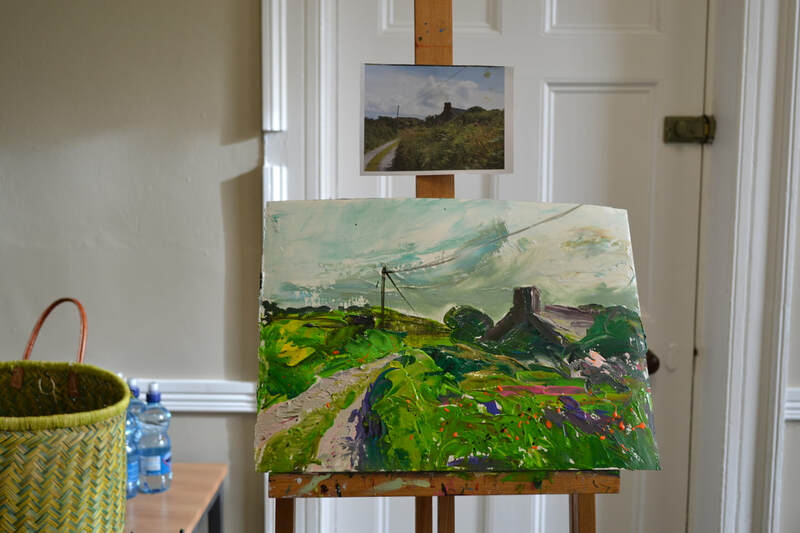 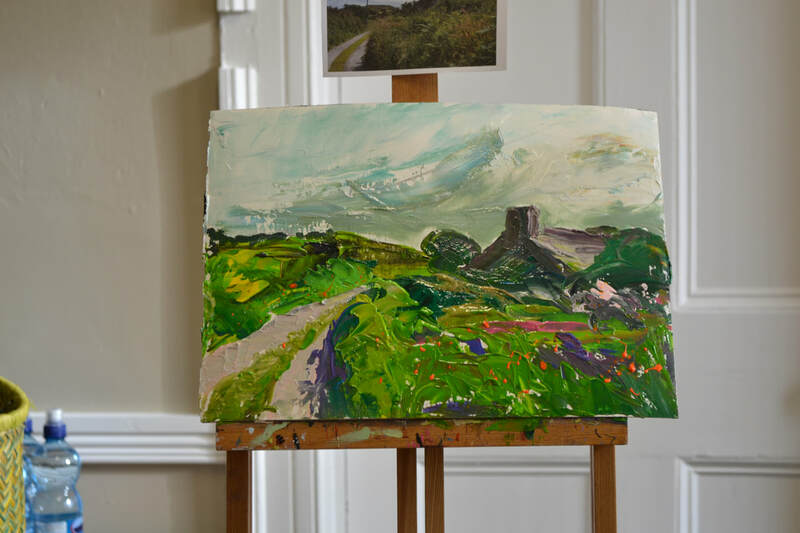 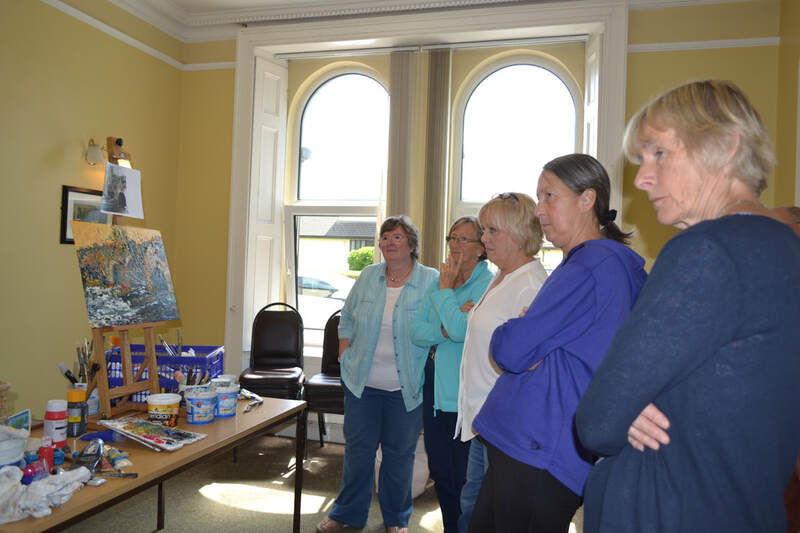 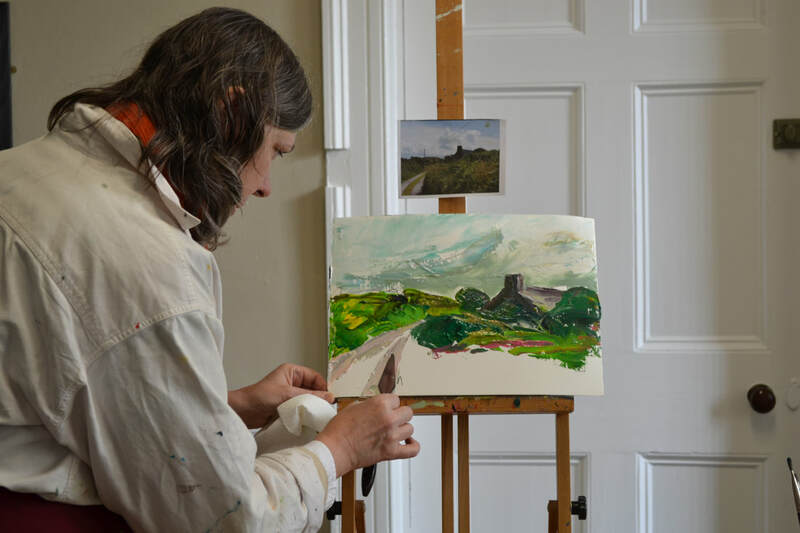 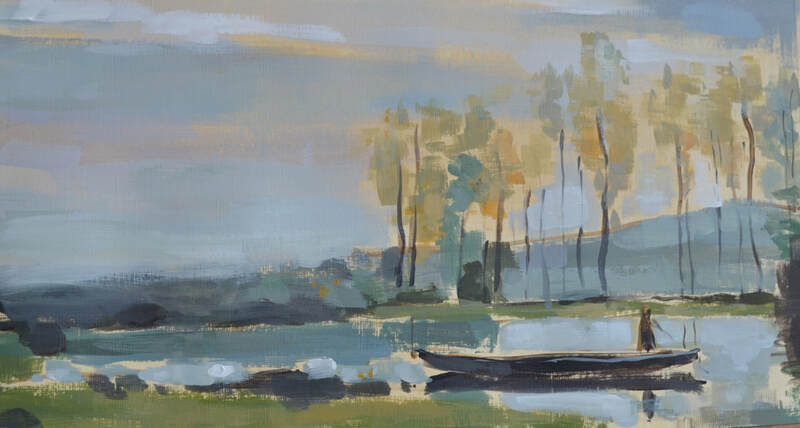 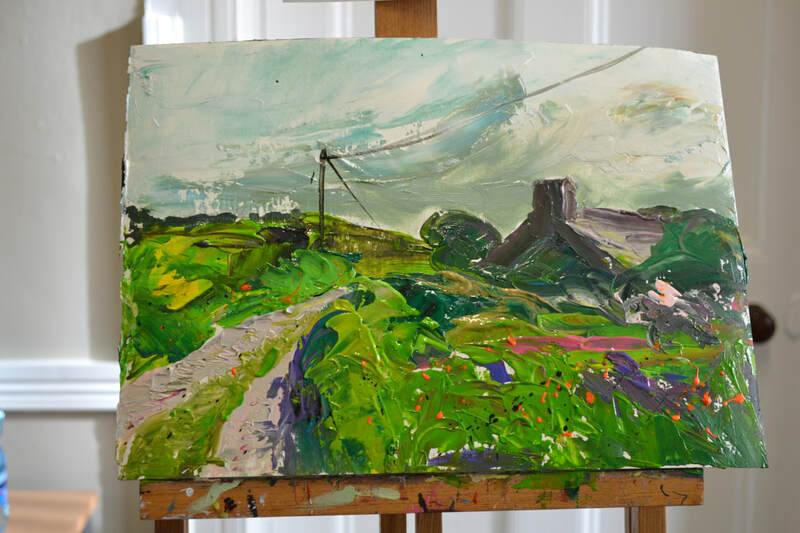 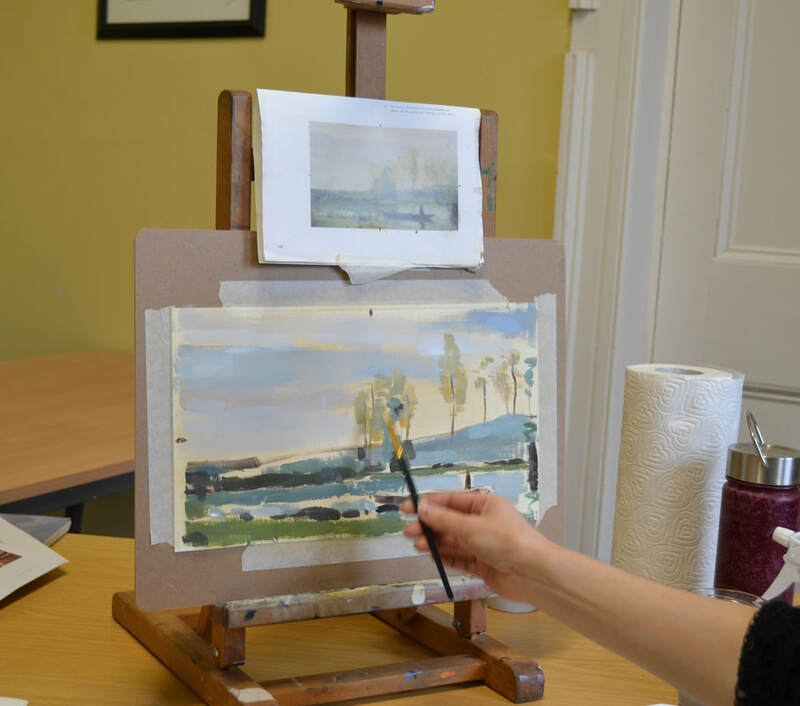 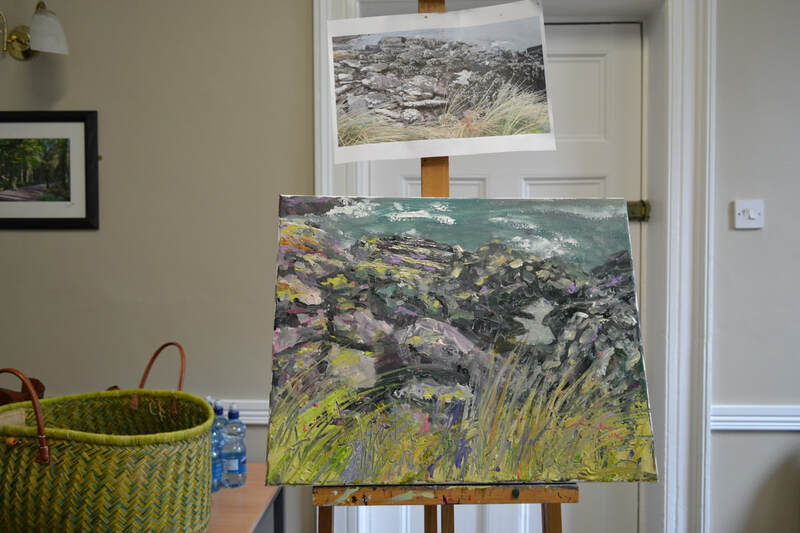 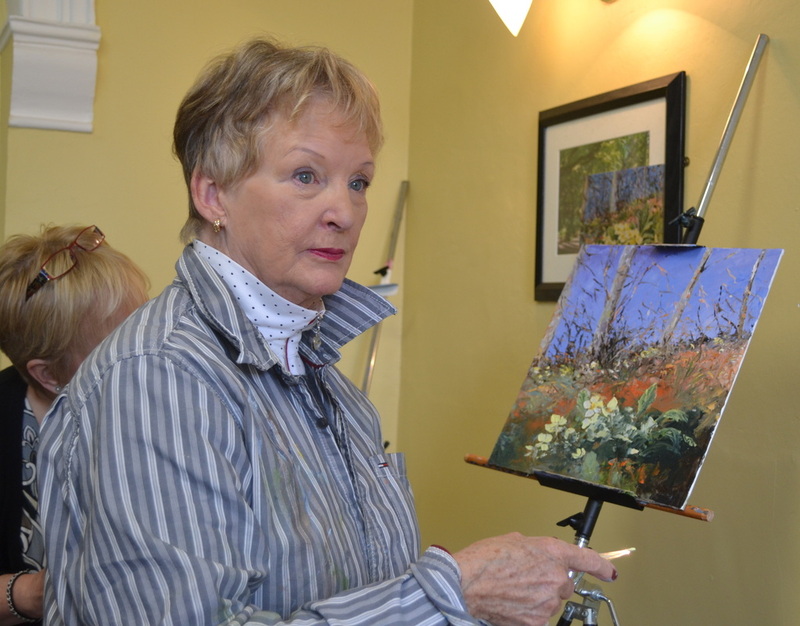 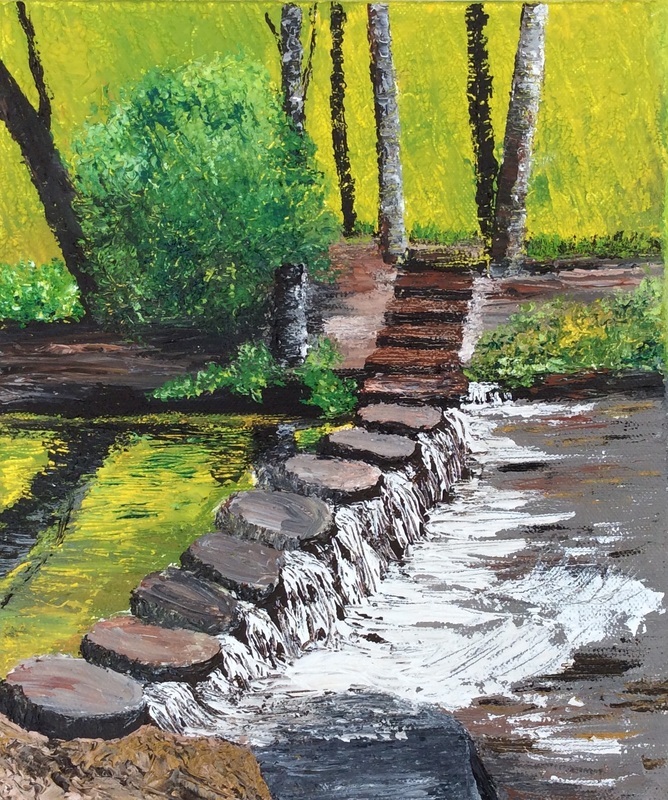 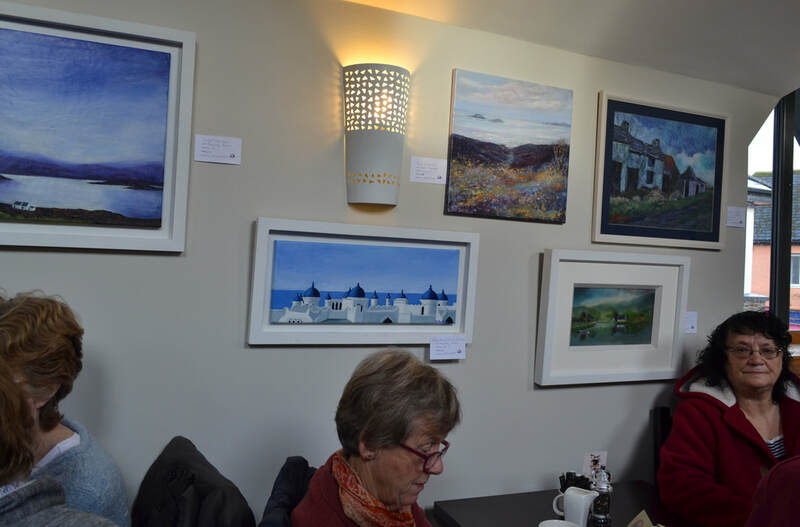 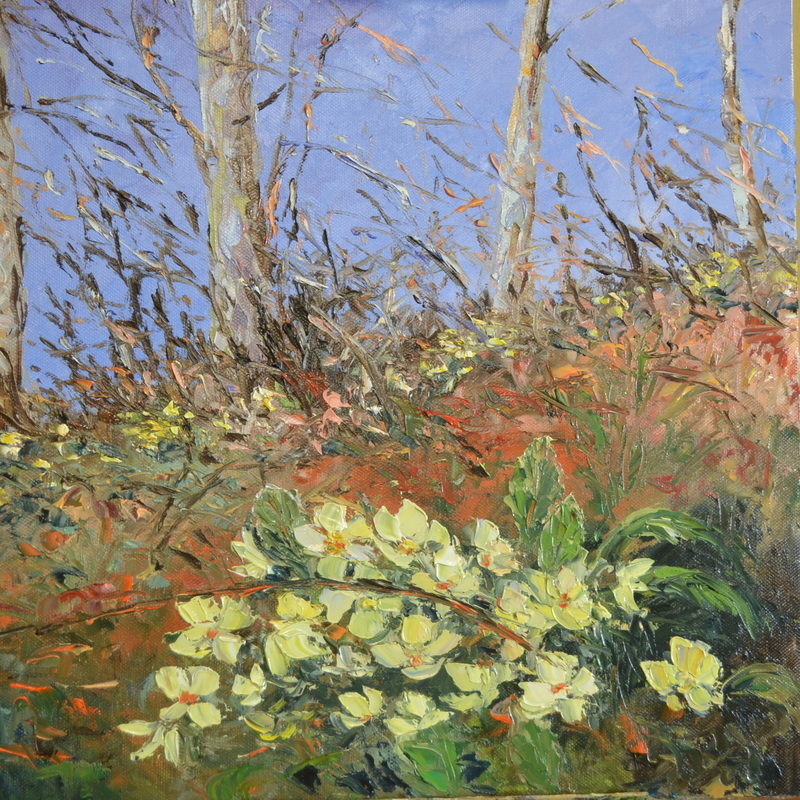 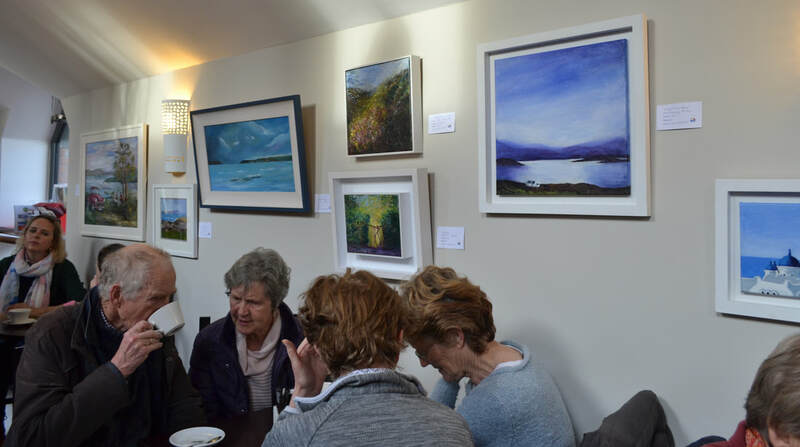 Jennifer McAuliffe was with us in April and did a lovely demo of a landscape in acrylic. 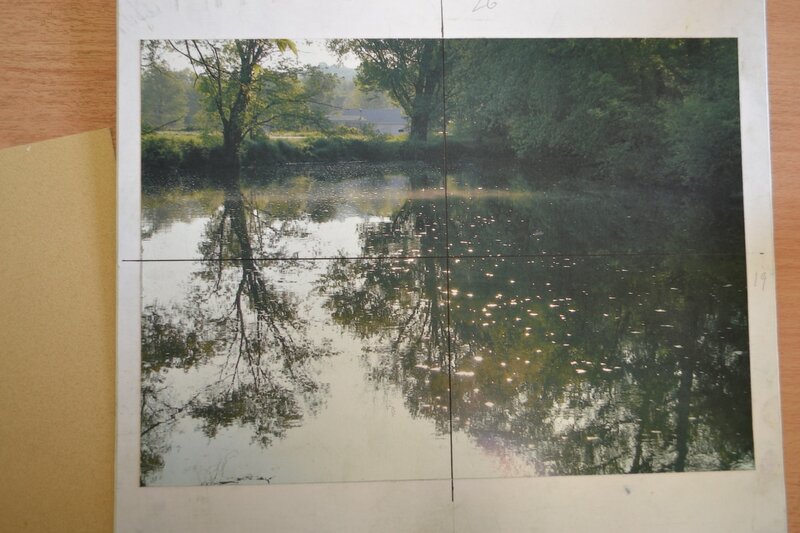 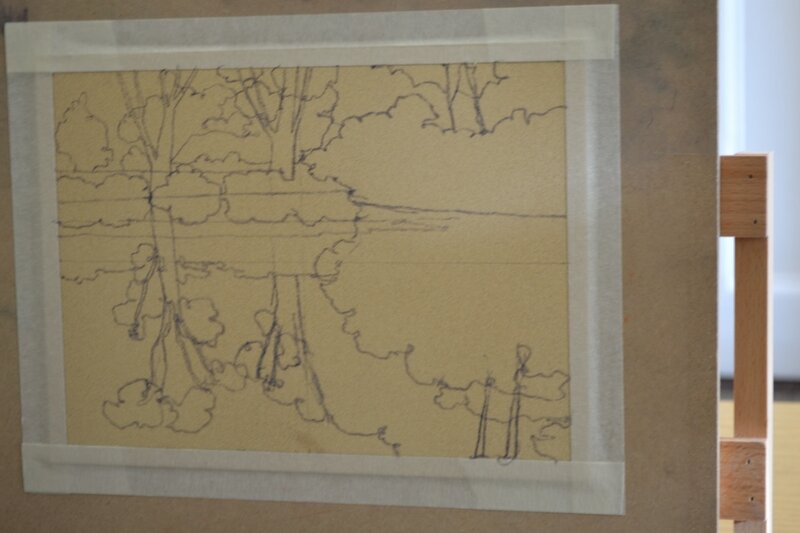 I have taken photos at different stages to show how it was done. 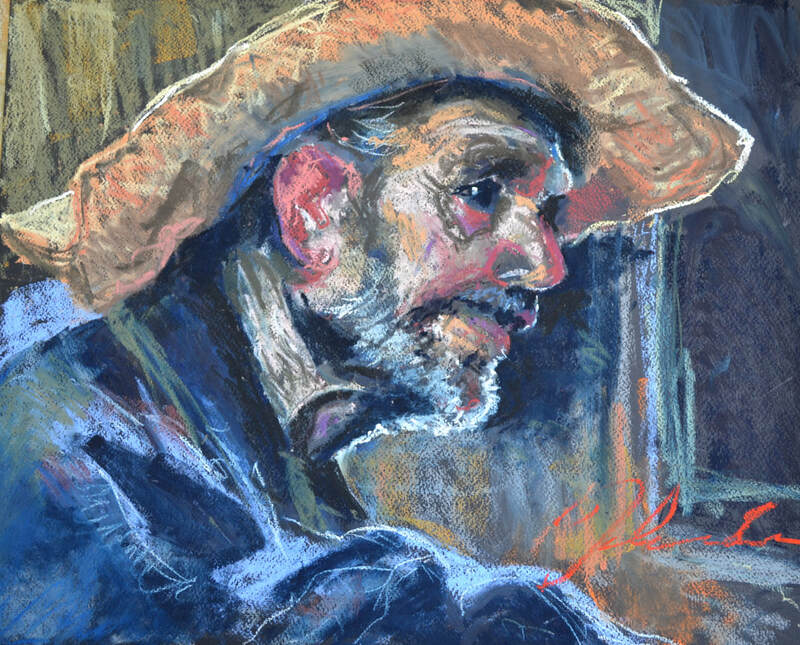 Jack Cornhouse one of the members of our group, very kindly did a demonstration in pastels for us last Friday. 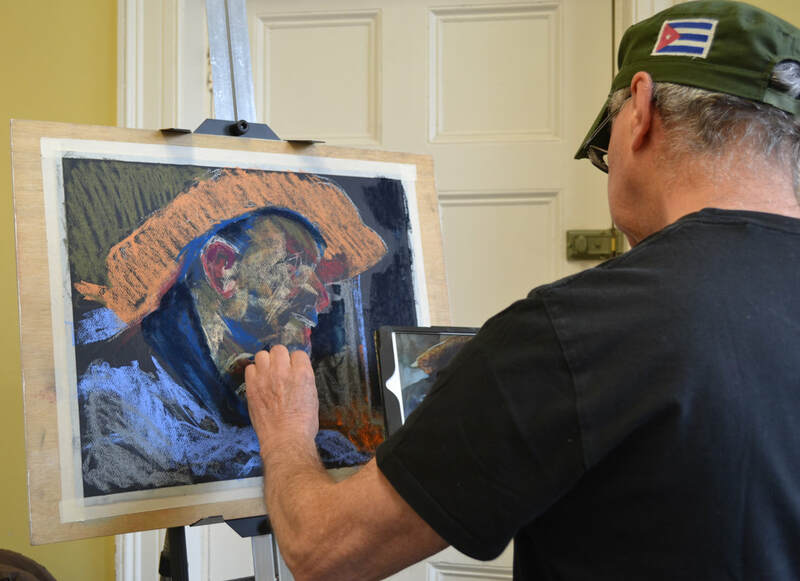 He was very interesting and entertaining and we enjoyed it very much, below are some photos of Jack at work, we learnt a lot from him, and hope to see another demo in the near future. 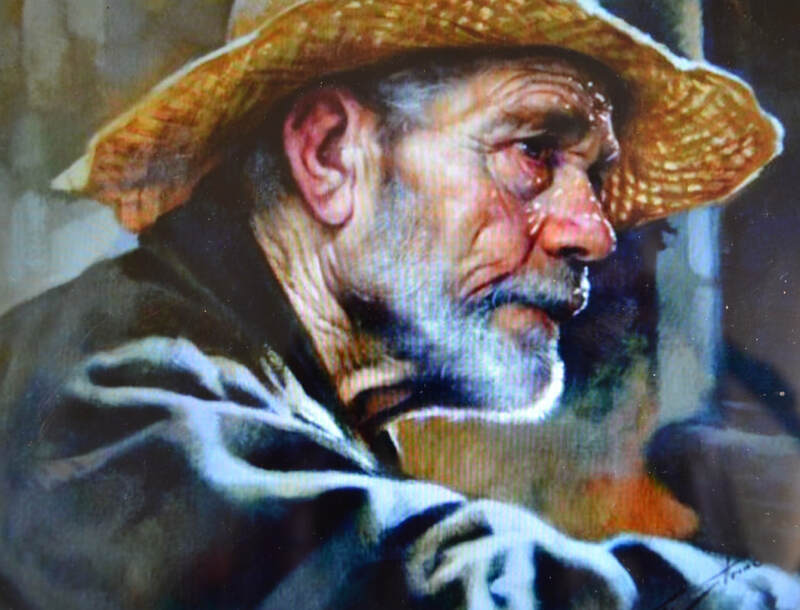 Thanks a million Jack. 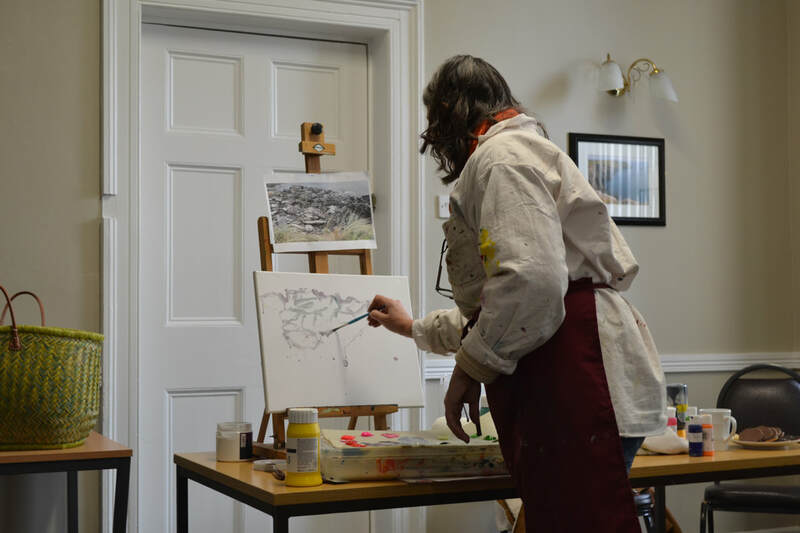 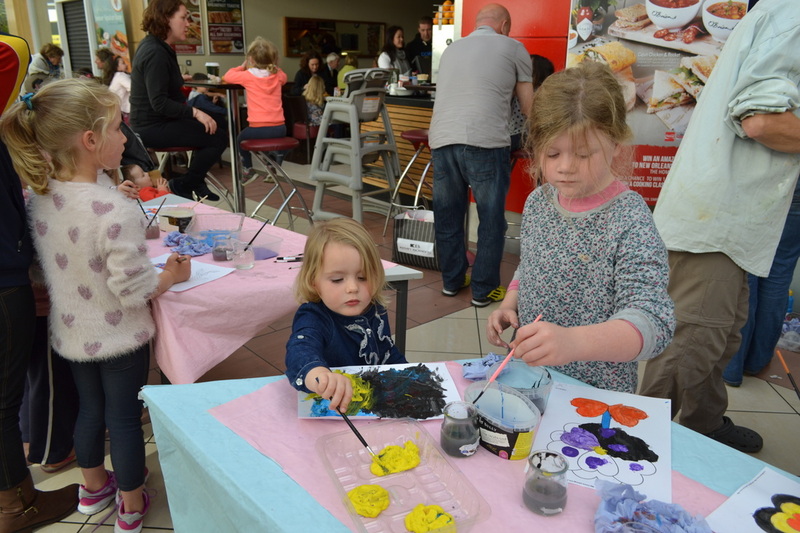 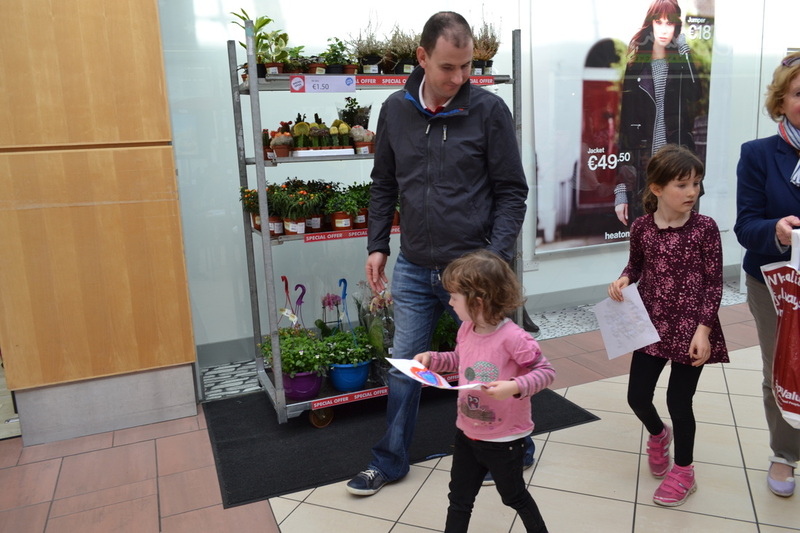 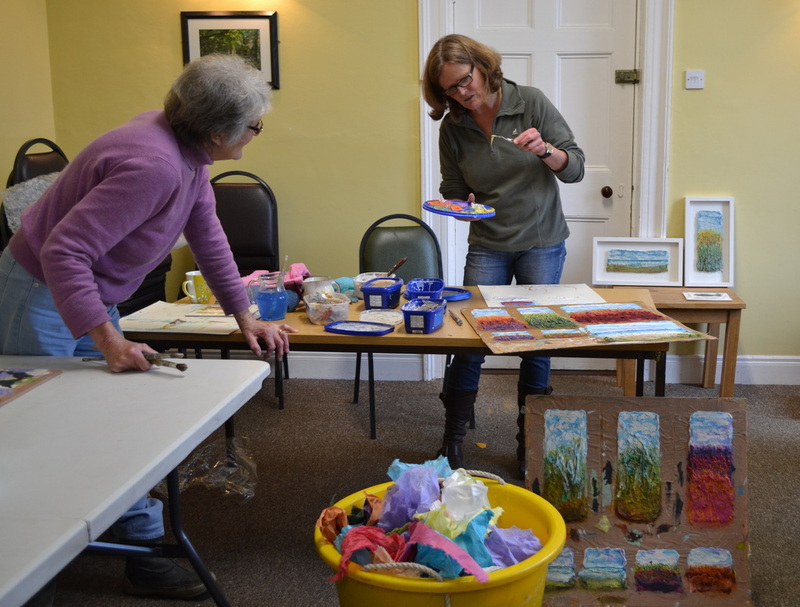 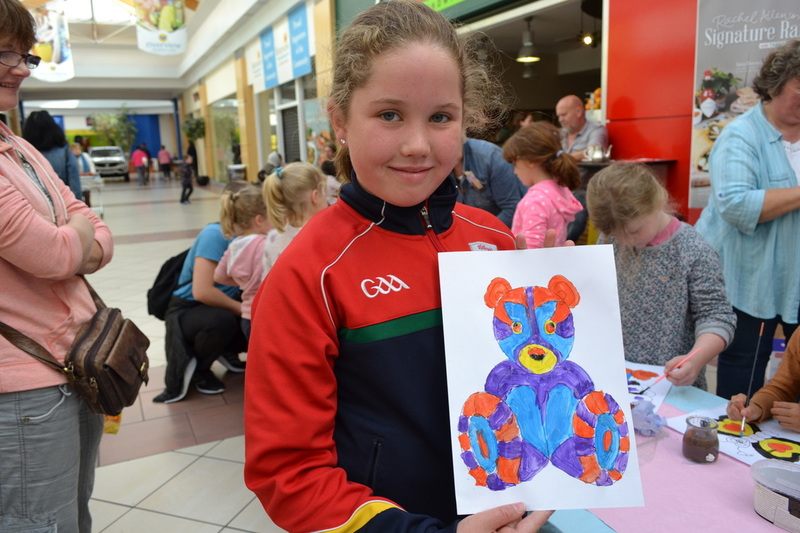 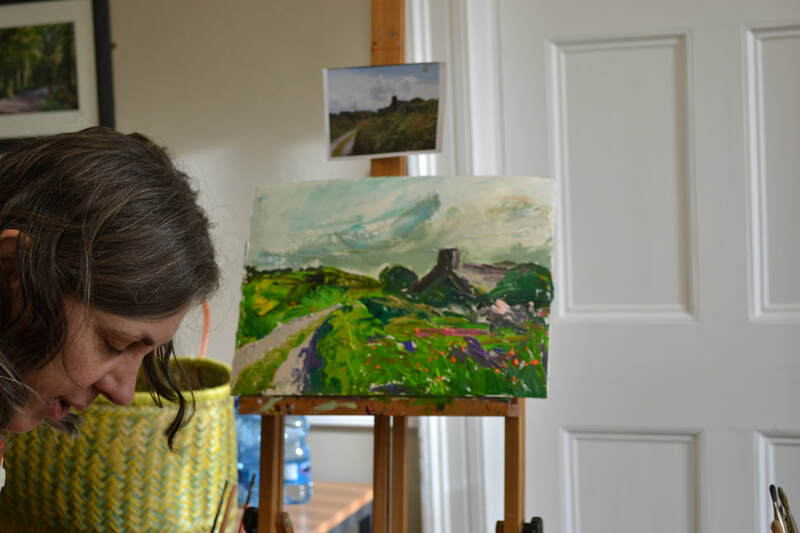 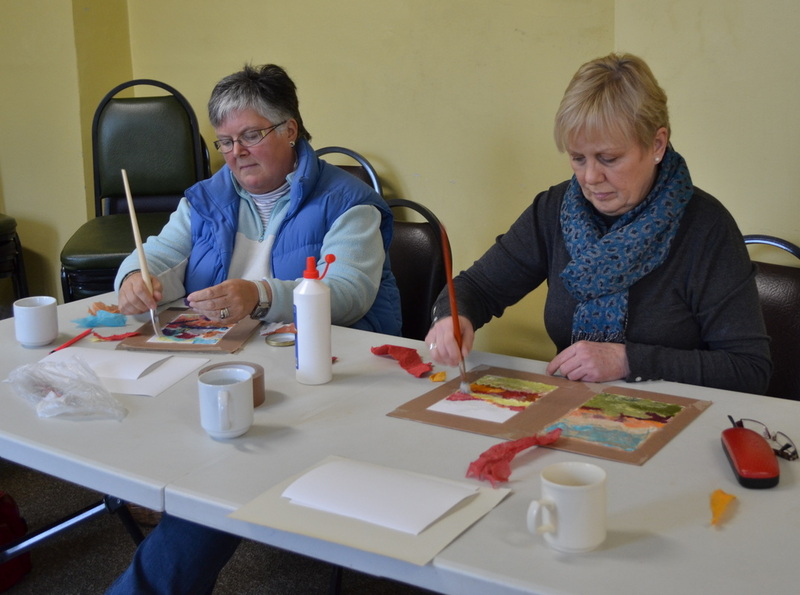 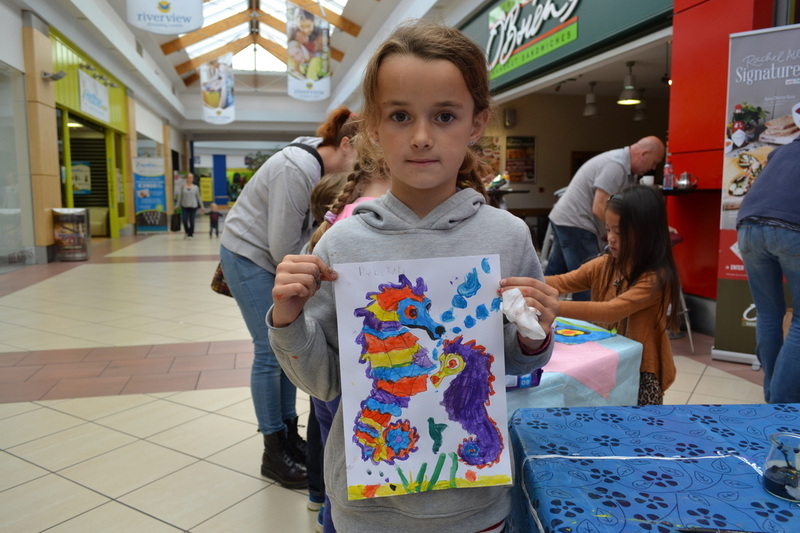 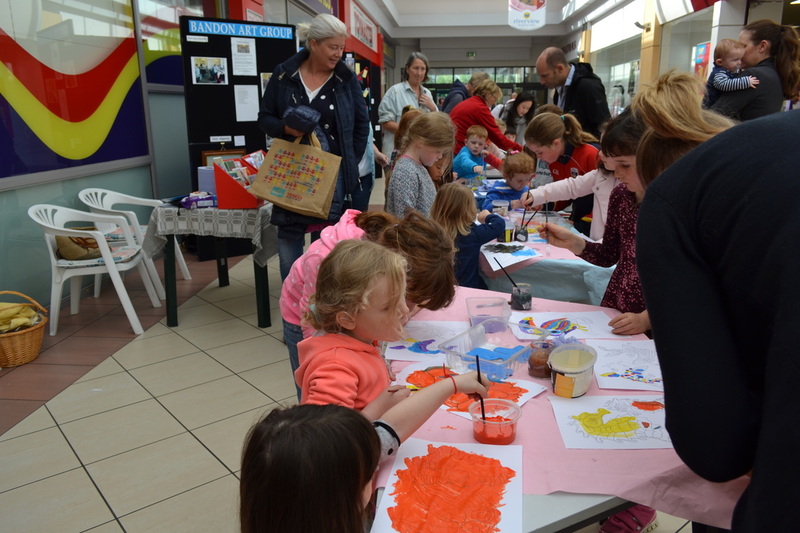 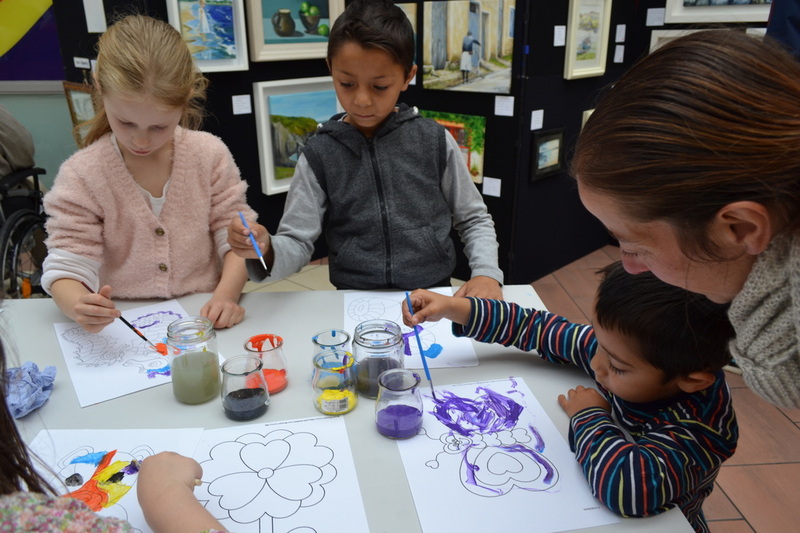 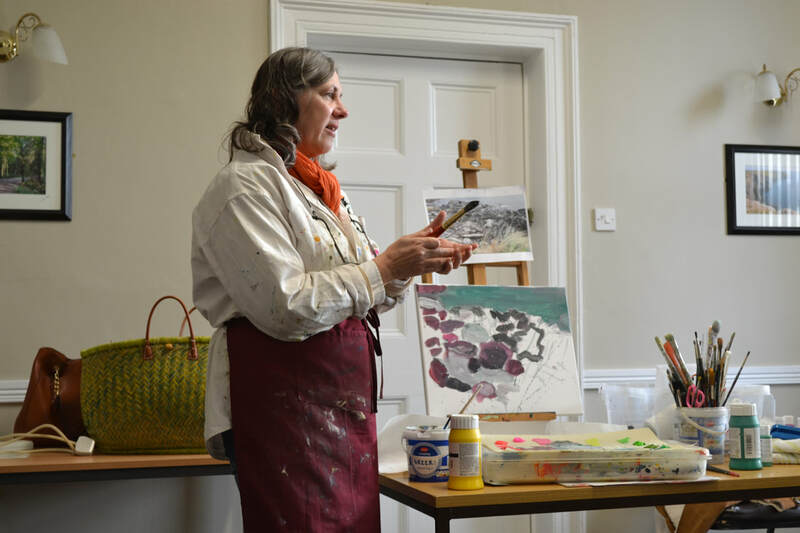 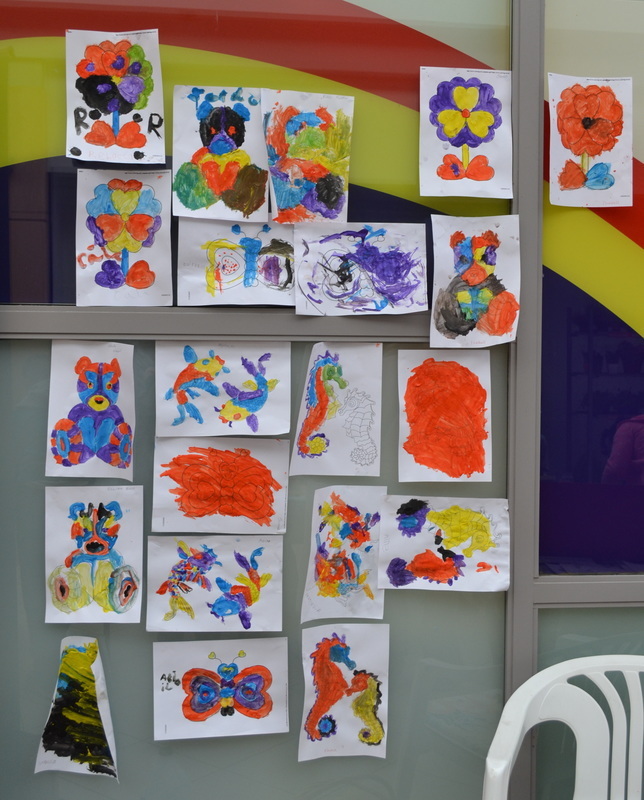 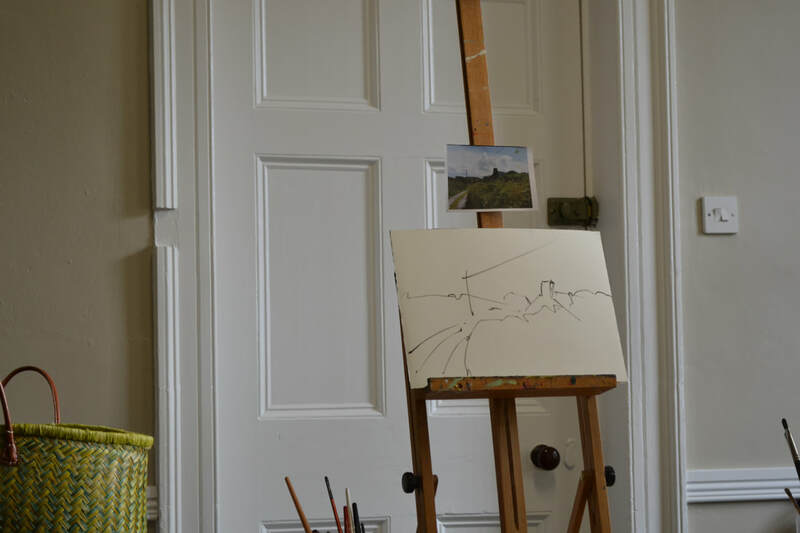 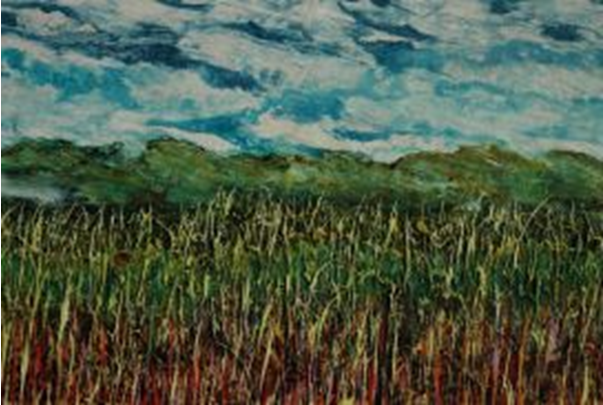 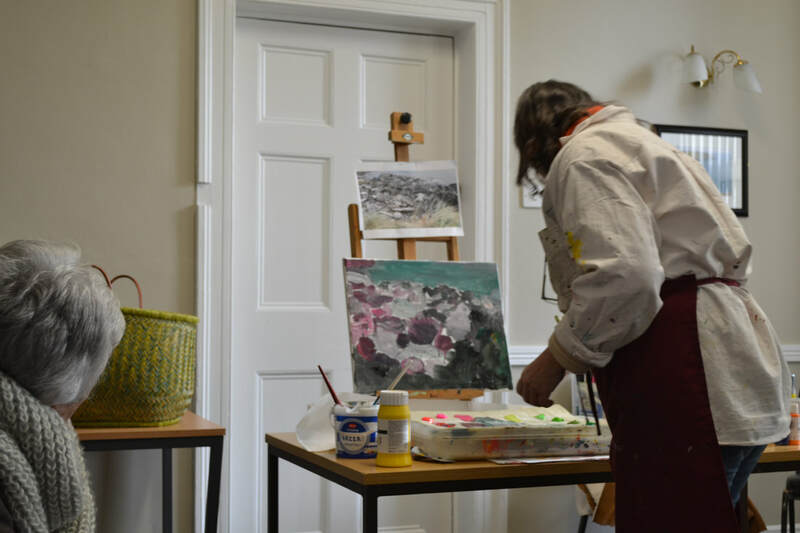 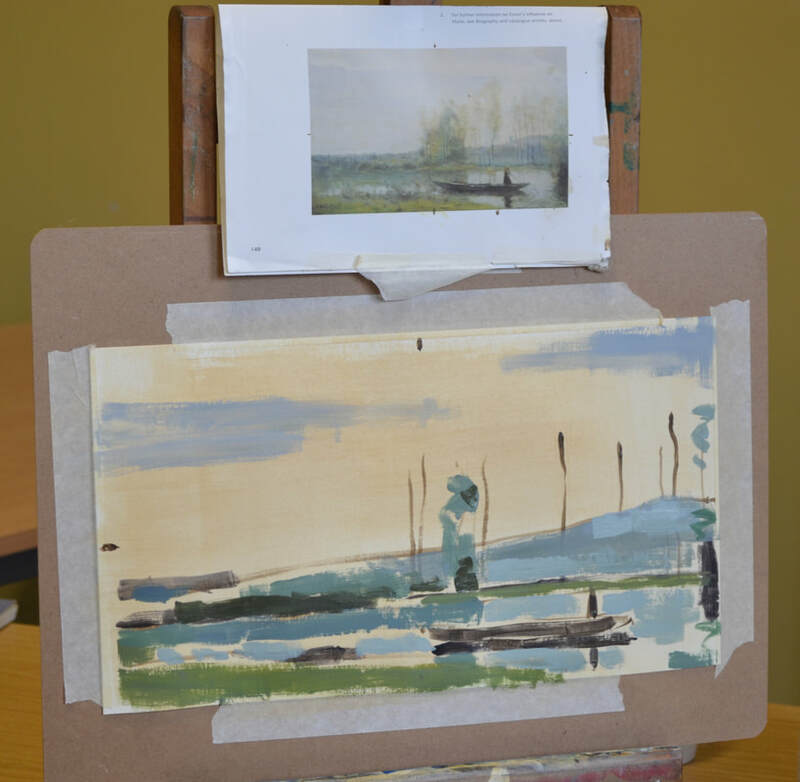 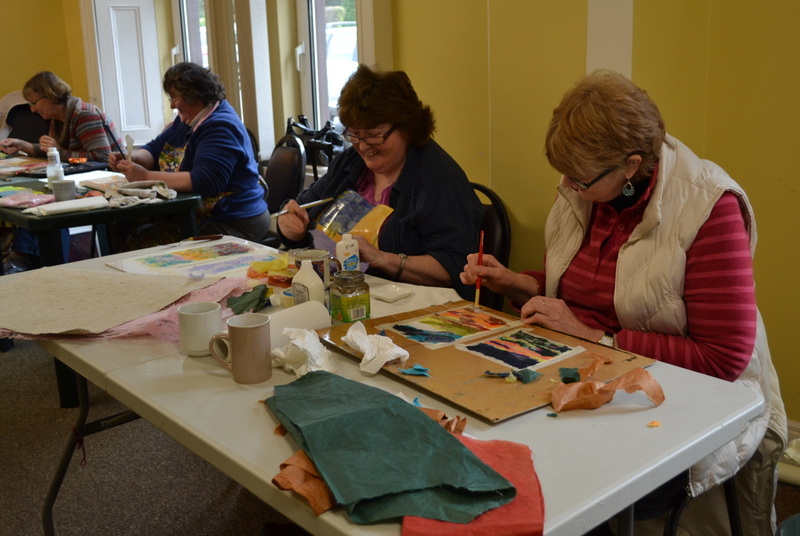 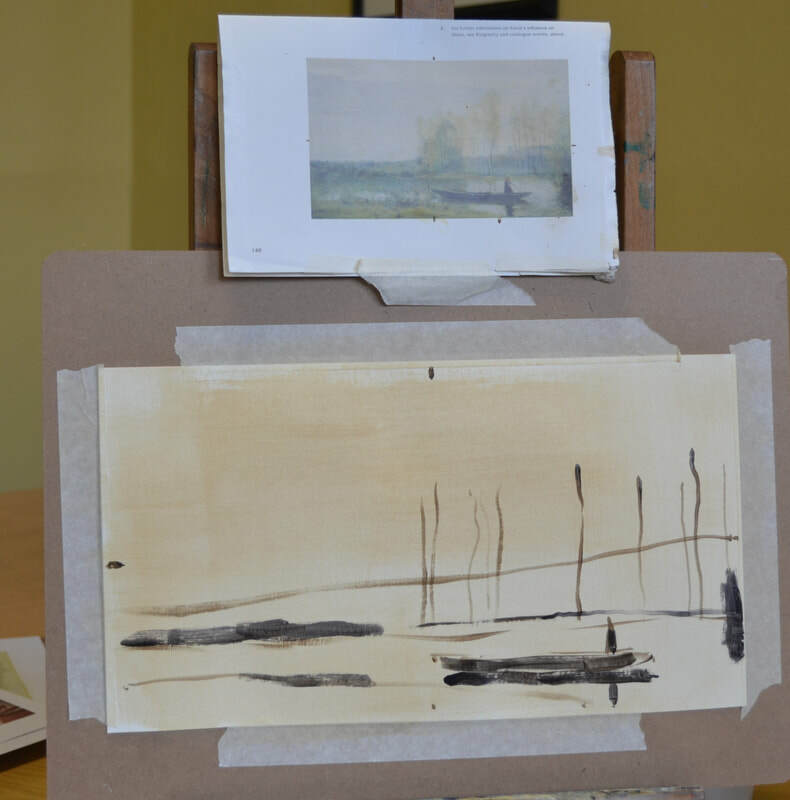 Cora Murphy came to us in February and inspired us all with her abstract landscape painting. 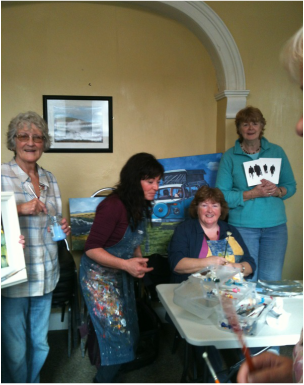 It was a great workshop and we all got to try out her ideas painting along with her. 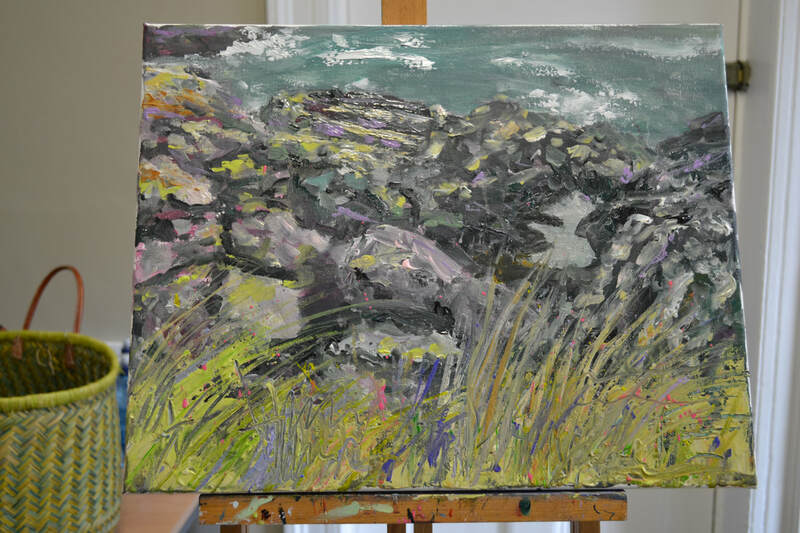 Hopefully it will give us some confidence to try more abstract paintings in the future. 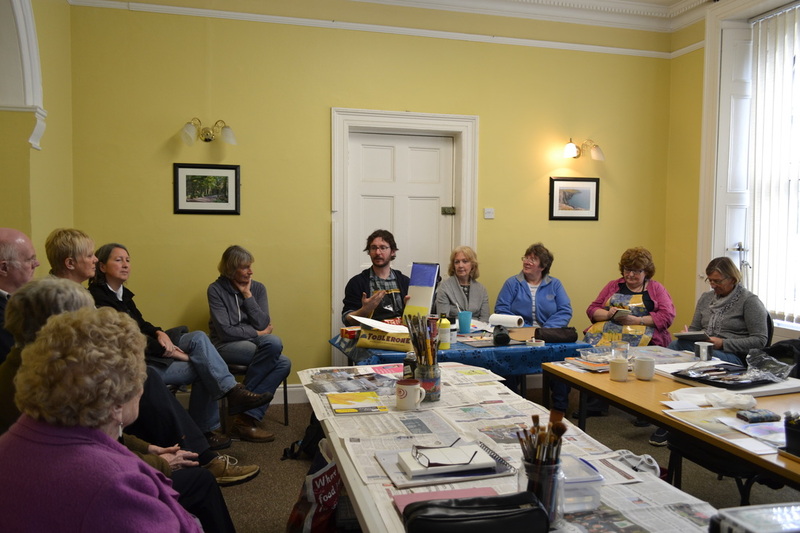 Victor Richardson giving a demonstration on 27th January to get the year 2017 off to a good start with new inspiration. 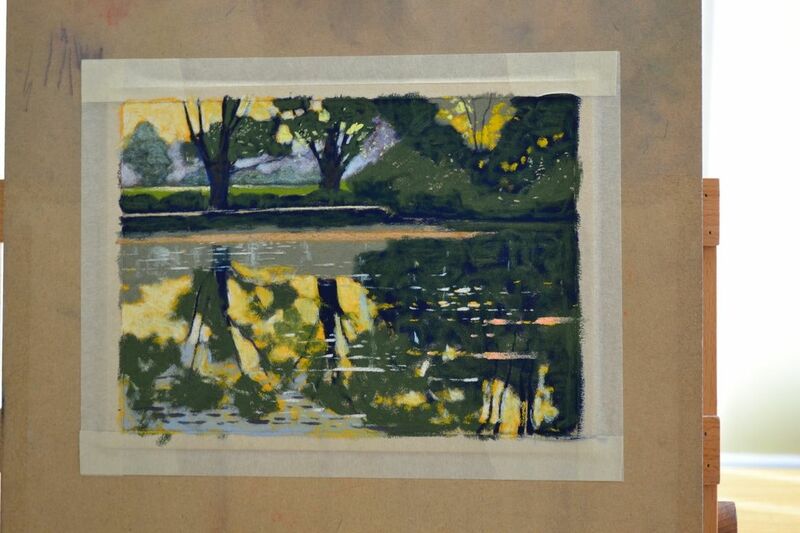 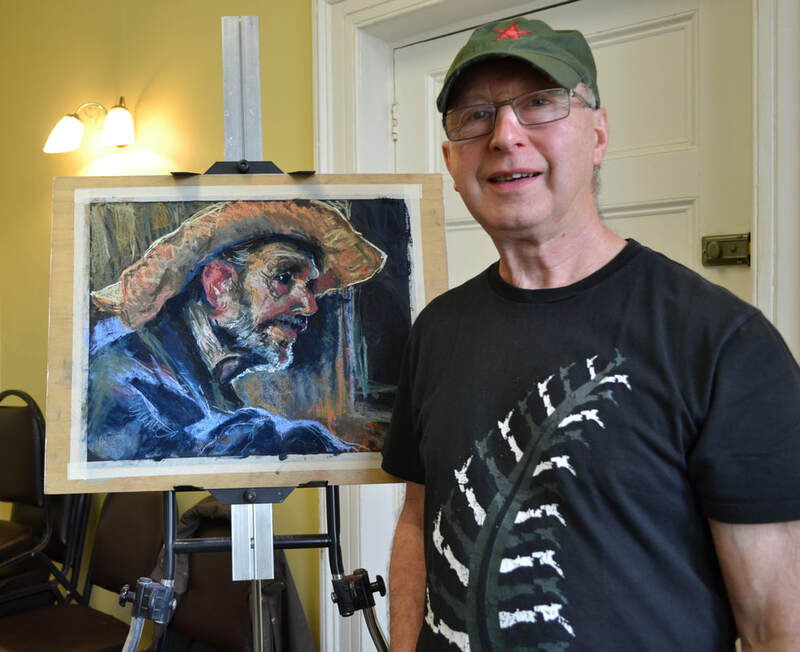 He did the painting below using pastels. 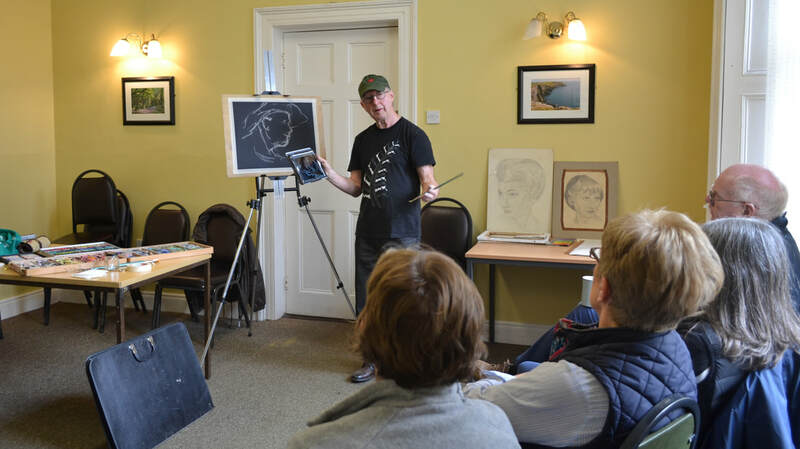 Victor giving us some tips. 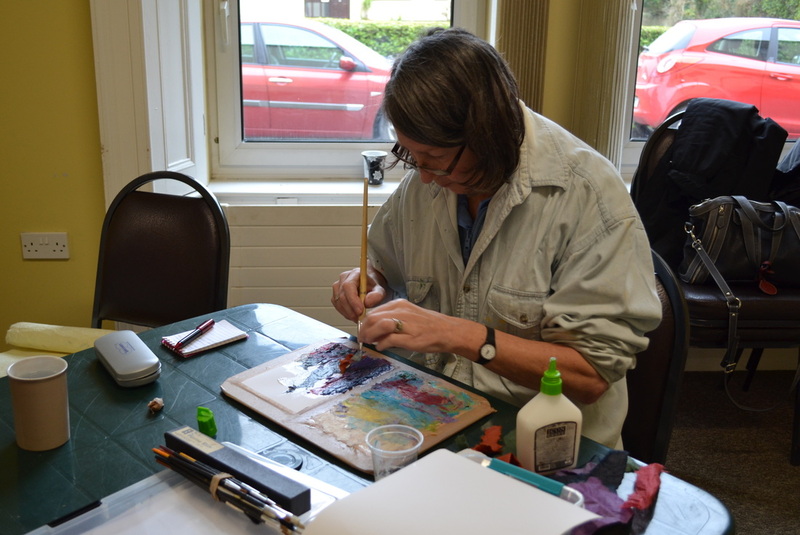 Kerry Collins showing us how it's done at our last workshop with her. 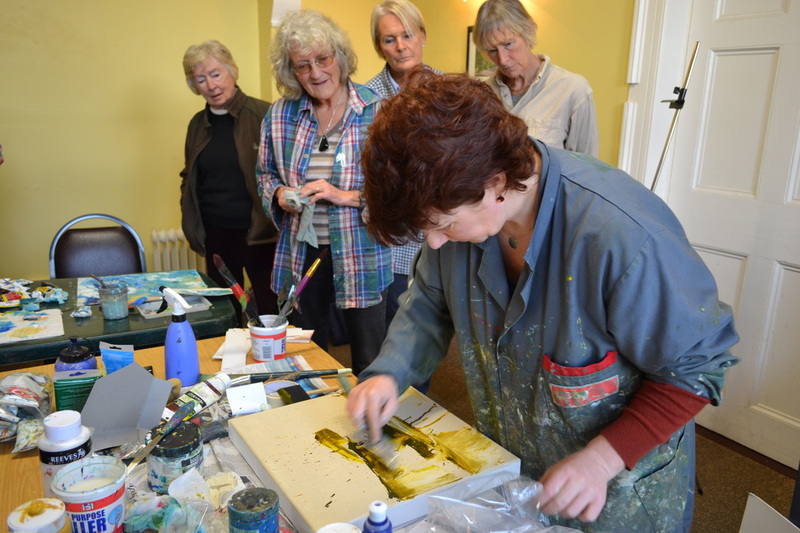 ﻿ We had a very busy morning trying out some of Cora Murphy's techniques, it was very inspiring, we could have stayed there all day! 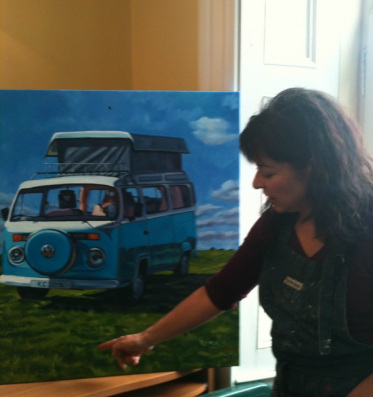 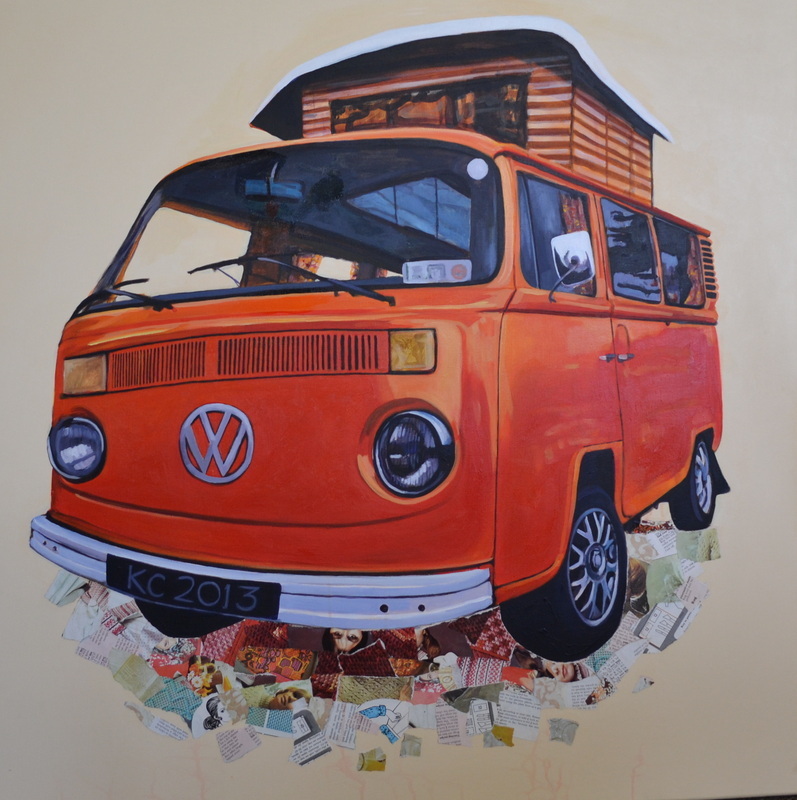 Kerry's painting of VW camper van with collage under the van. 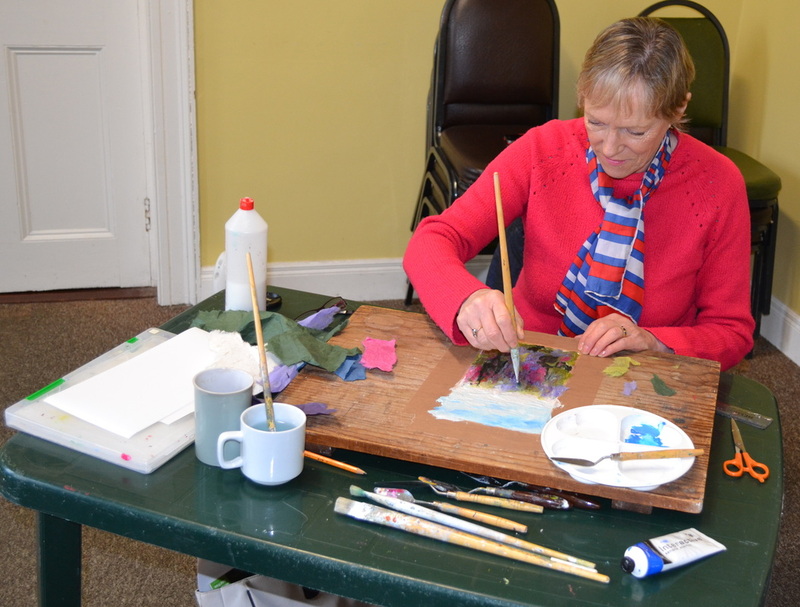 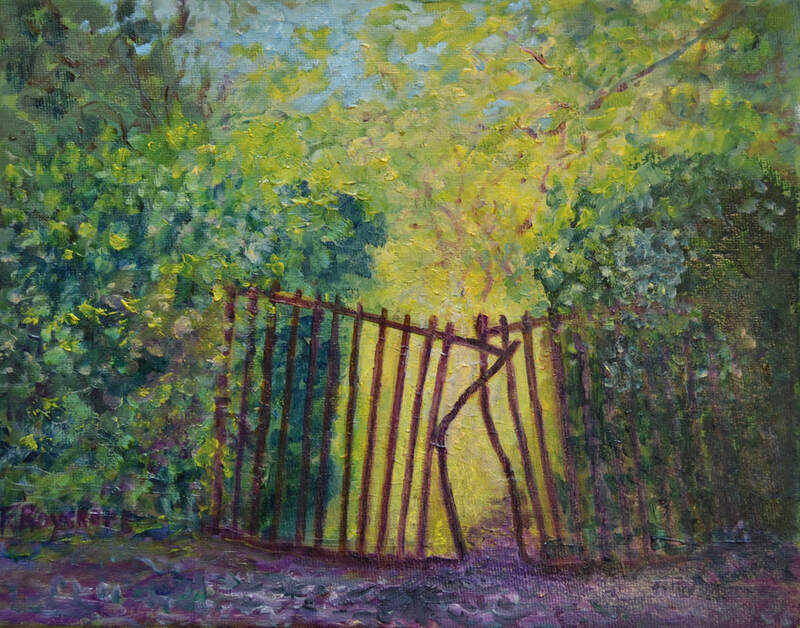 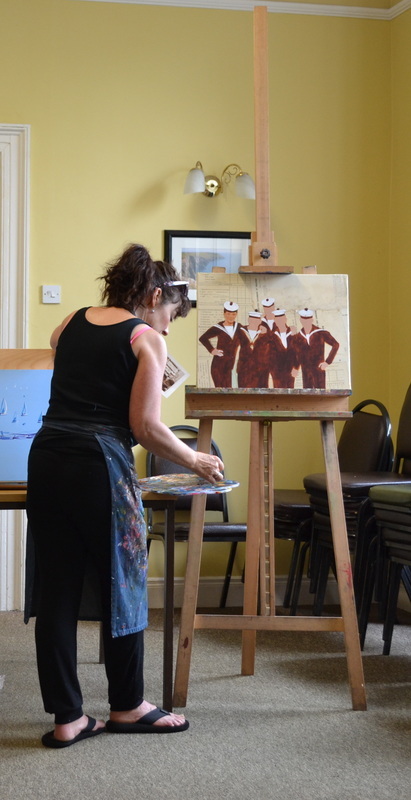 Peg Quinlin's workshop was very inspiring, she used a pallette knife to paint and completed the whole painting in the morning. 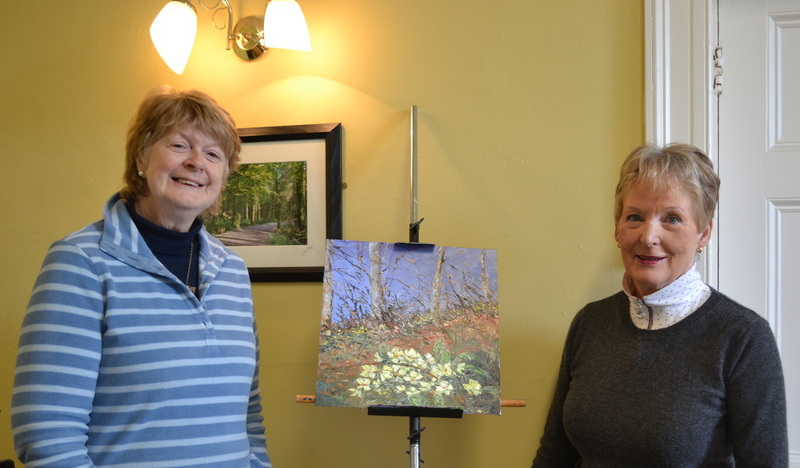 Peg very kindly gave us the painting to raffle and Sue was the very lucky winner! 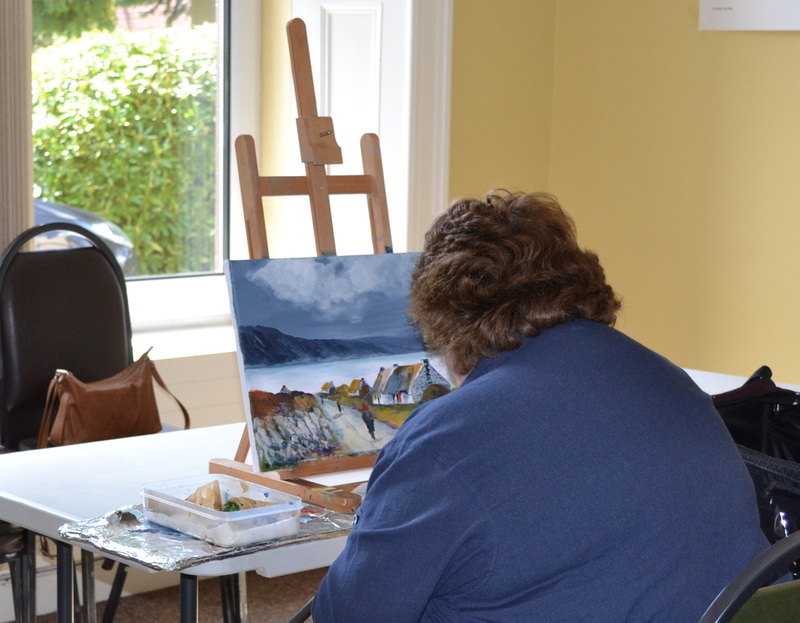 Yvonne's finished painting all done in the one day Well done! 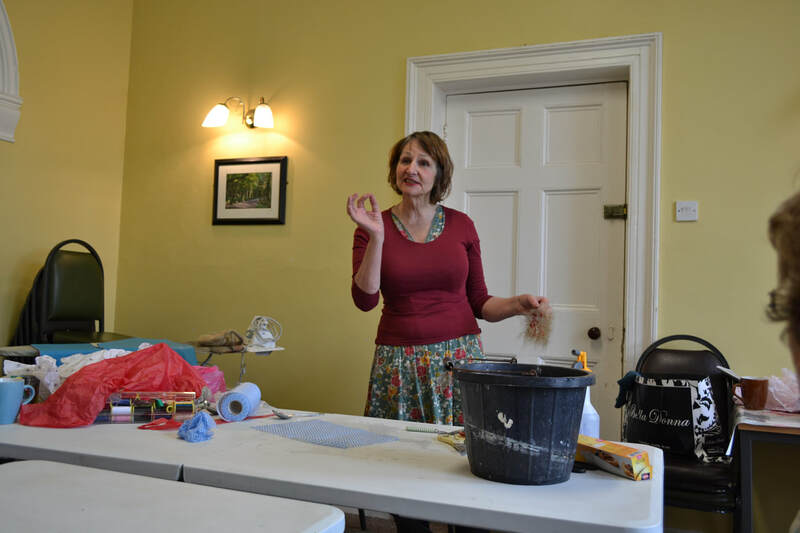 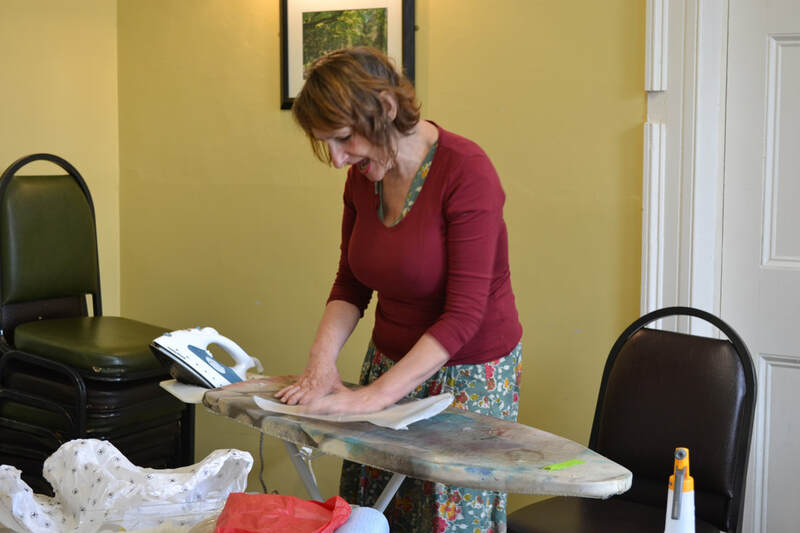 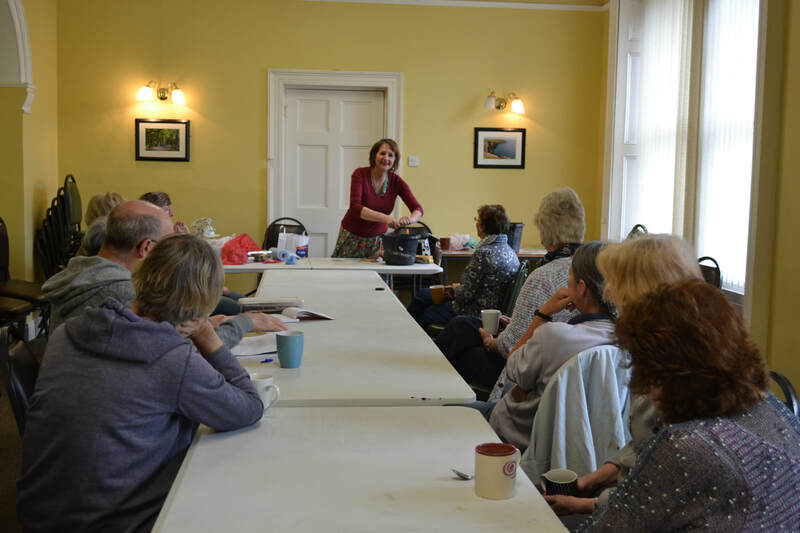 Kerry Collins came and gave us another of her inspiring workshops on Friday October 11th - we enjoyed the last one sooo much !! 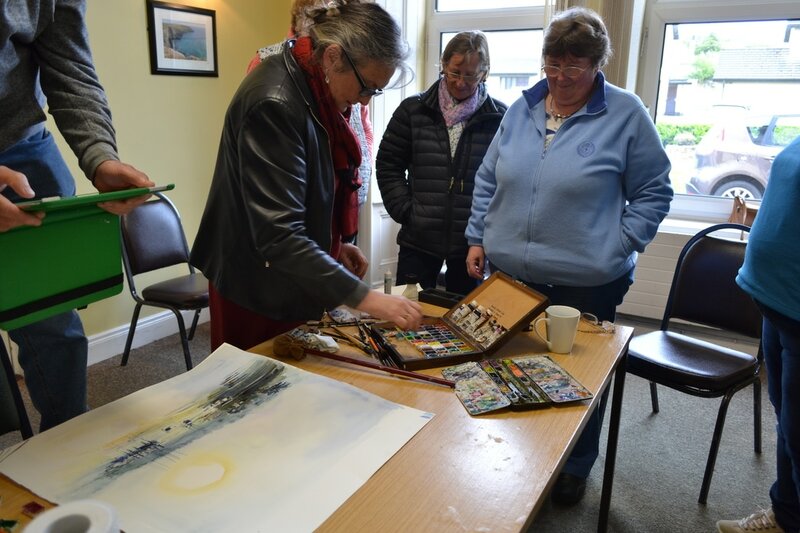 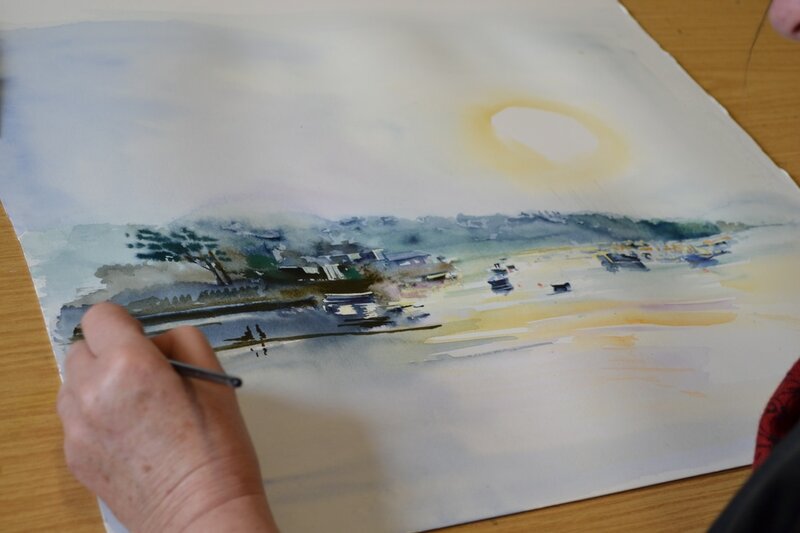 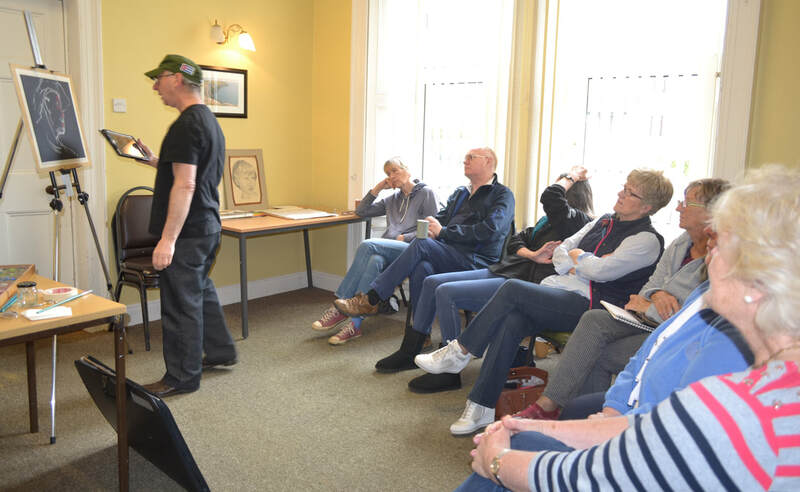 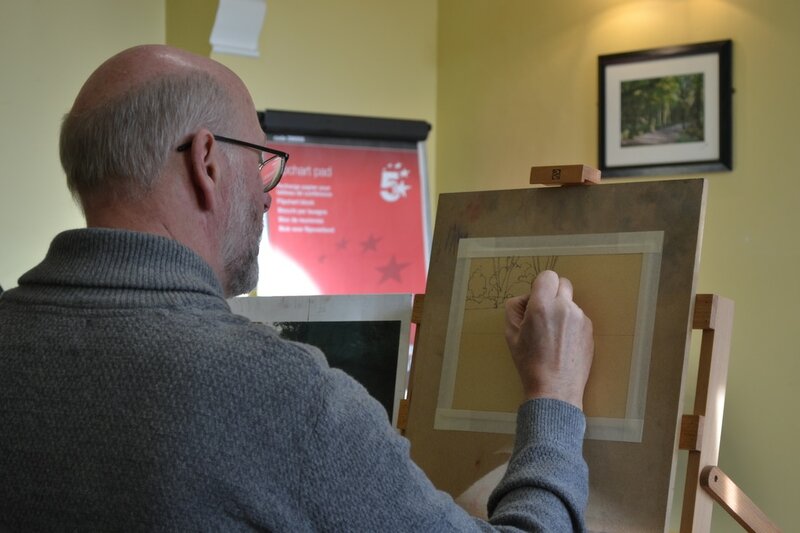 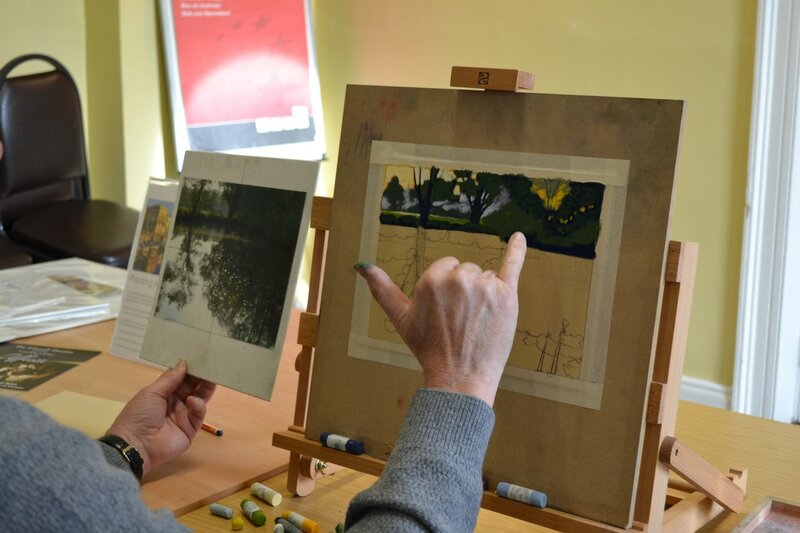 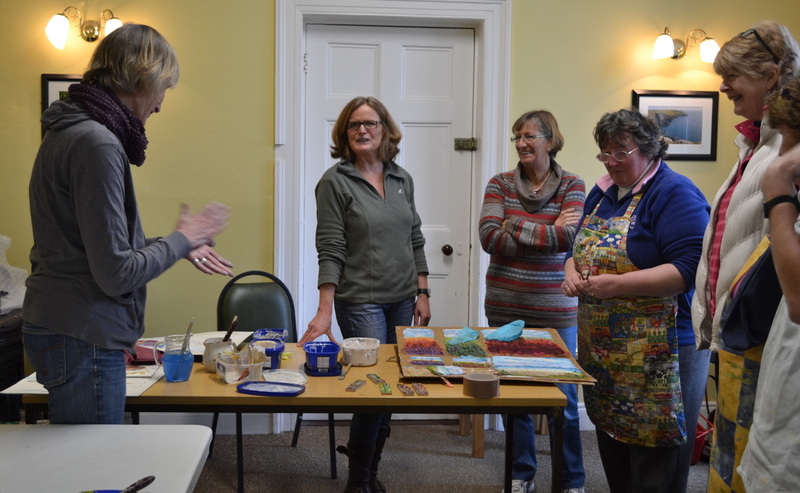 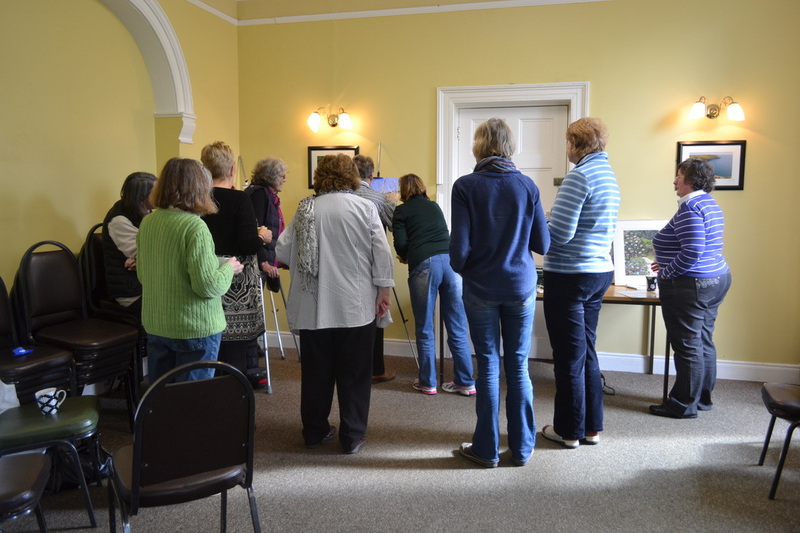 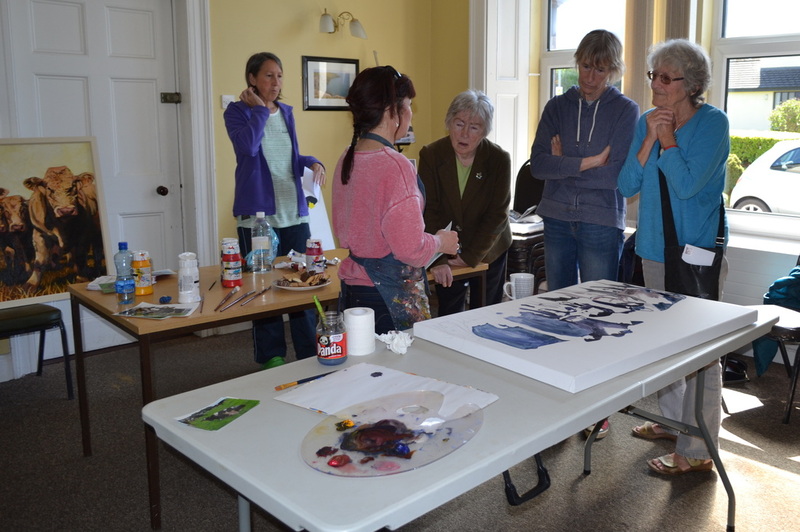 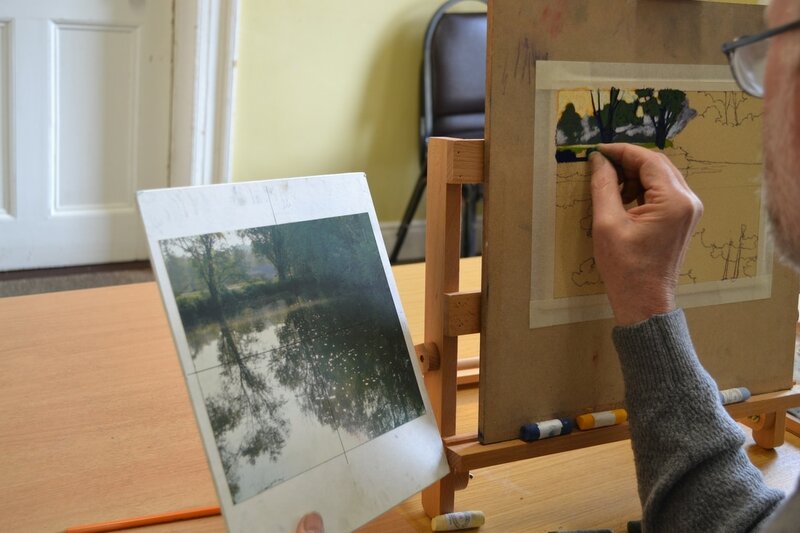 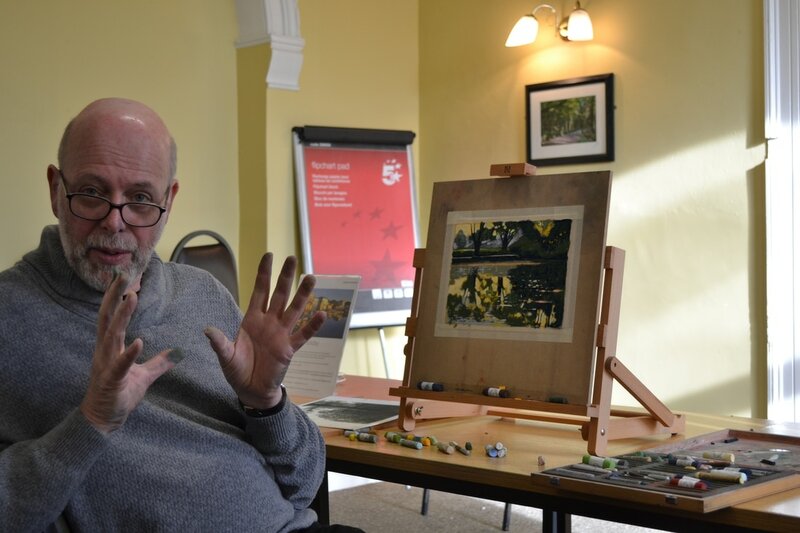 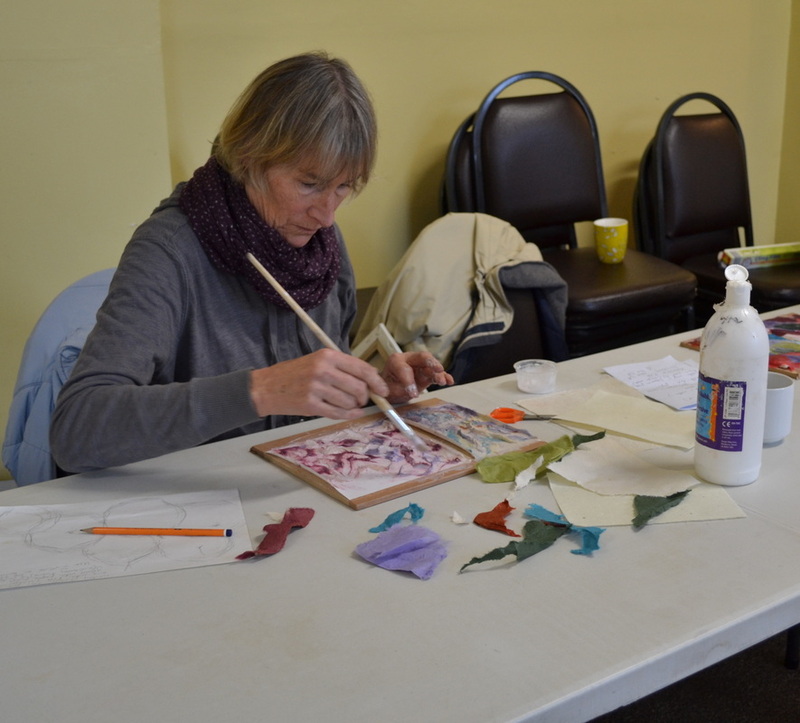 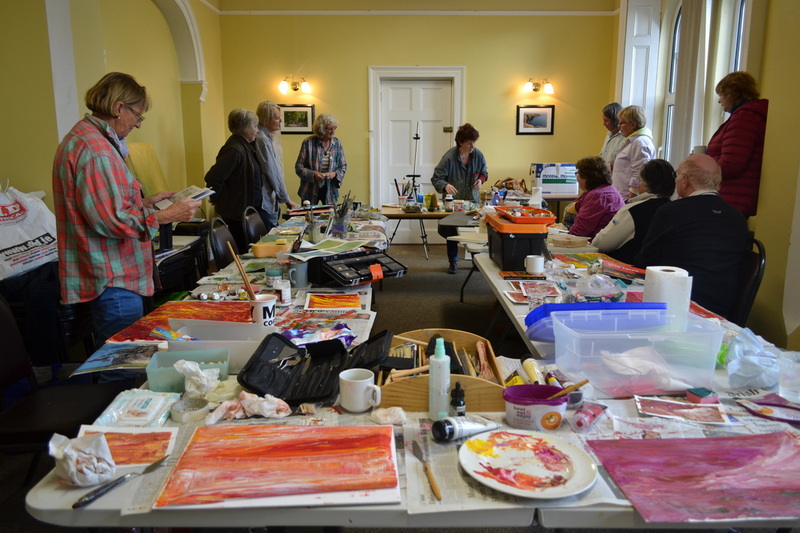 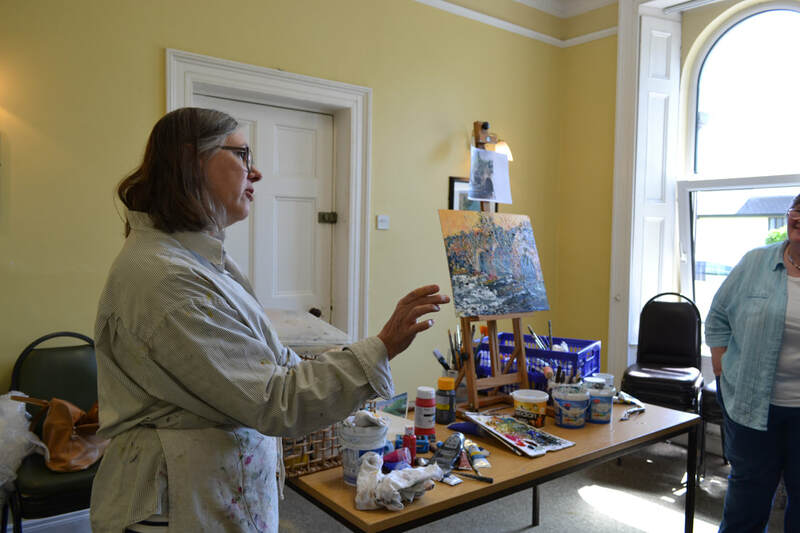 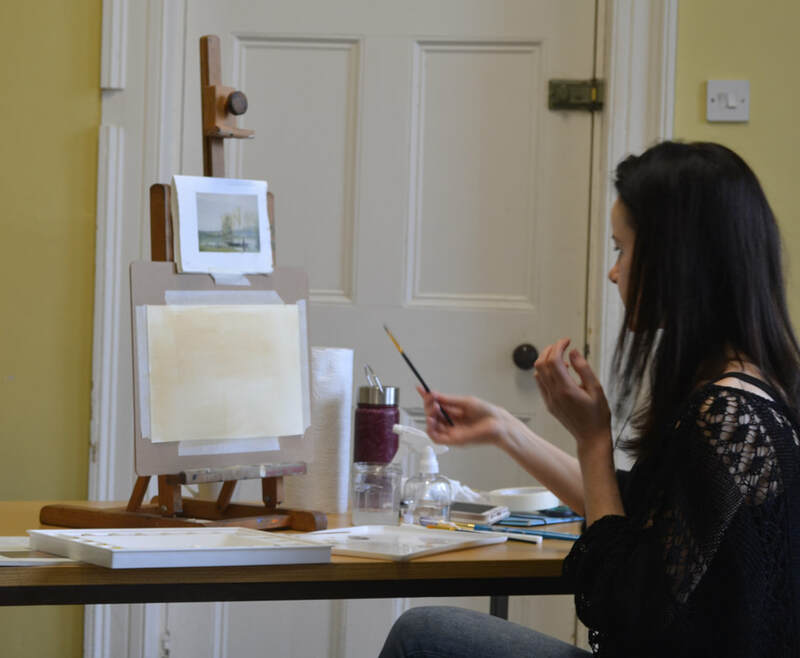 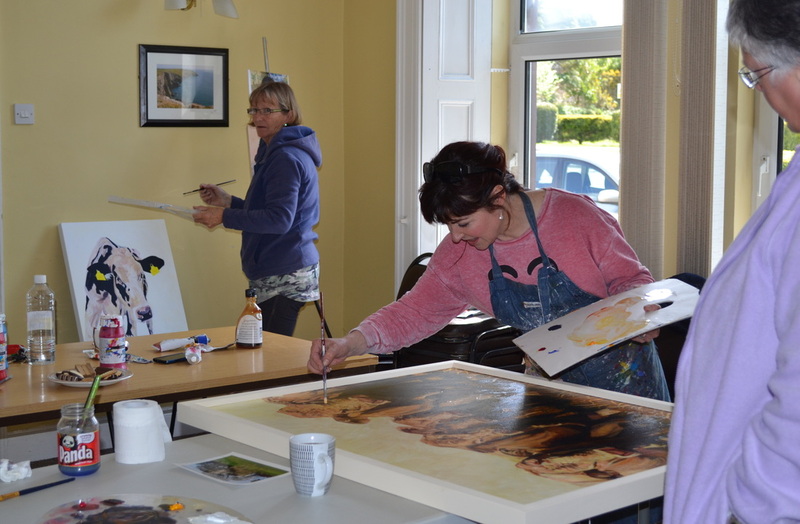 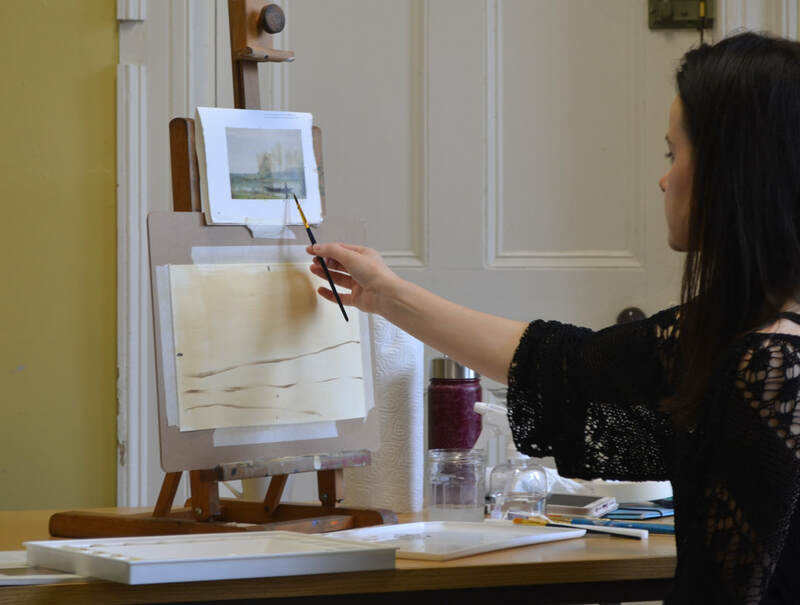 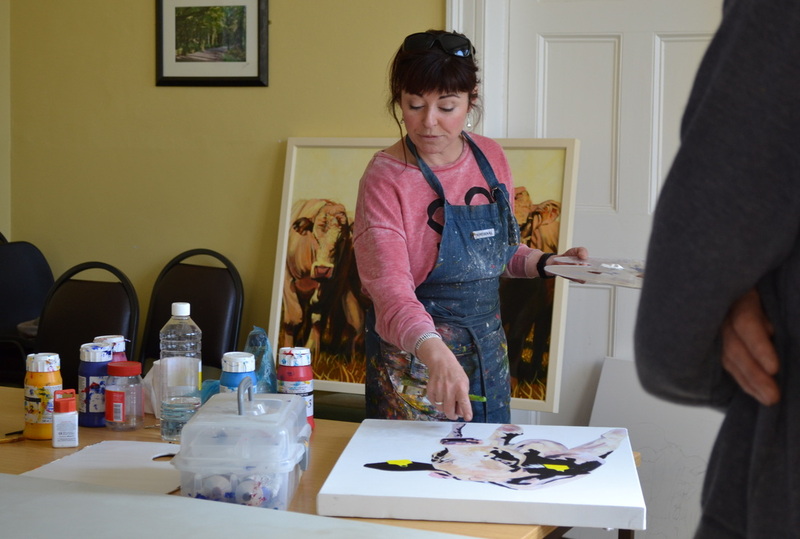 We had a wonderful workshop with Kerry Collins who came to teach us how to enhance the light in our paintings. 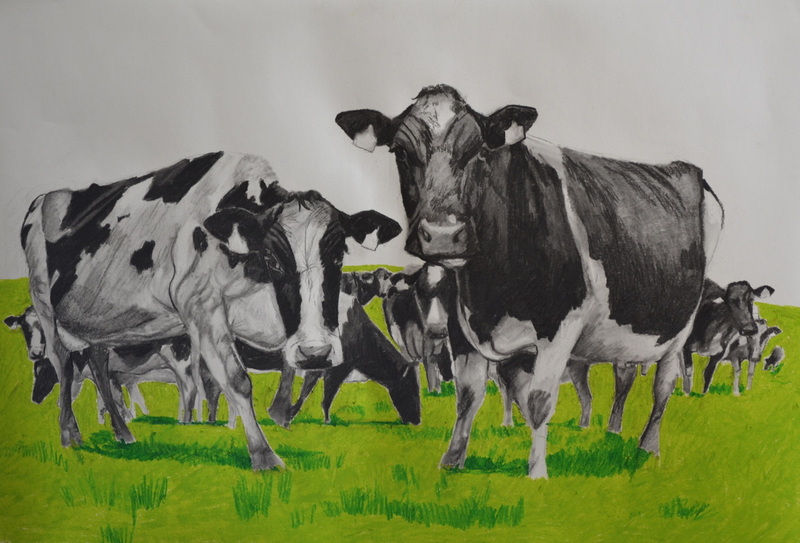 She brought some of her own work in progress to demonstrate on - they were huge canvases of cows which were fantastic! 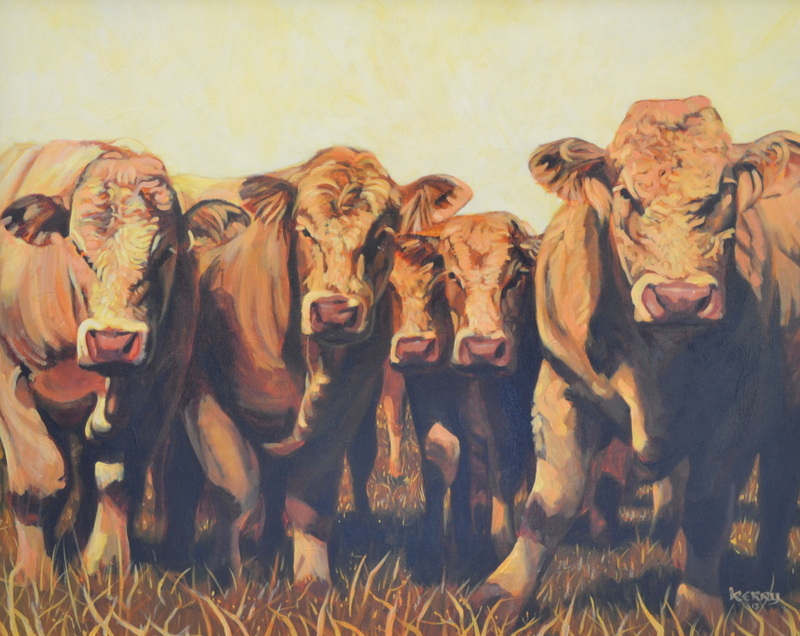 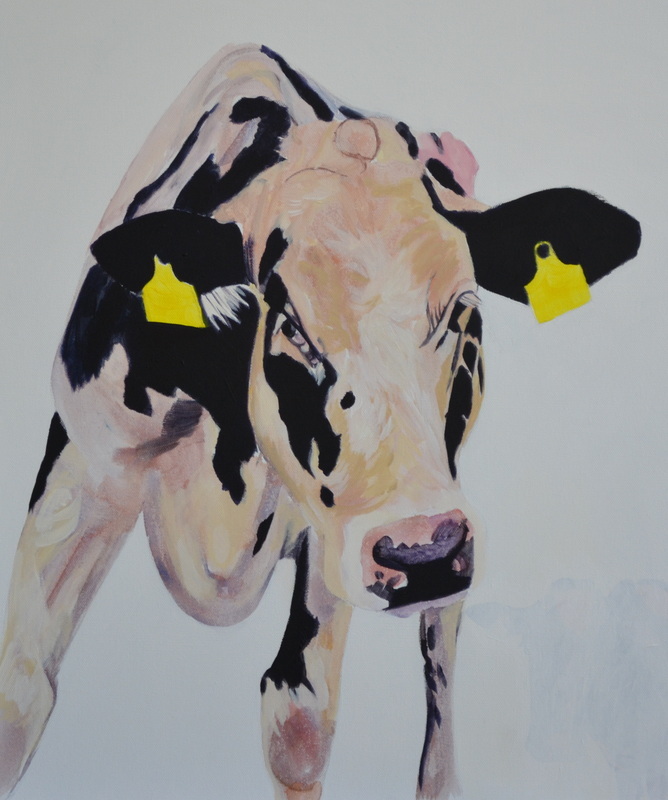 - we were just so sorry that Evelyn one of our members who paints cows very often was away on holidays !! 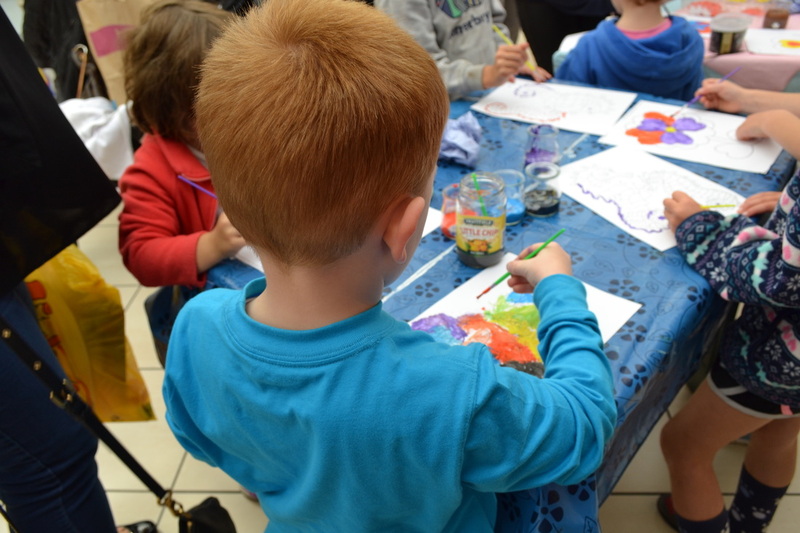 Eat your heart out Ev !! 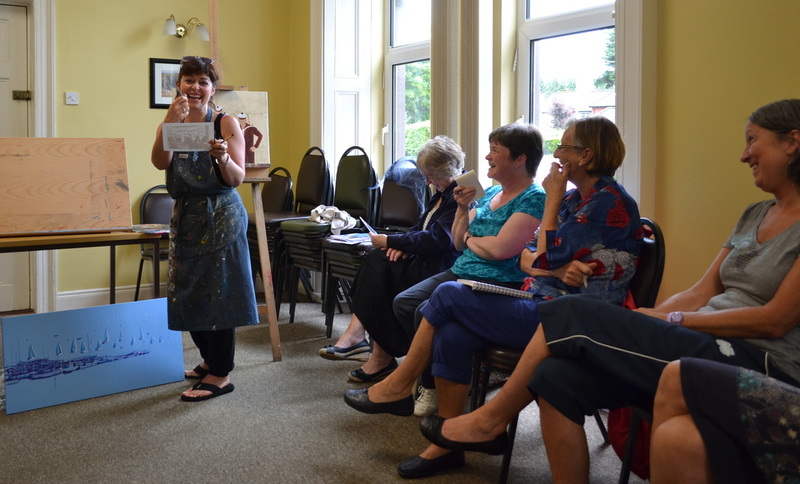 For the second half or the workshop Kerry helped those who had brought work in for advise which went down very well we were all inspired by Kerrys bubbly approach which makes everything look so easy . 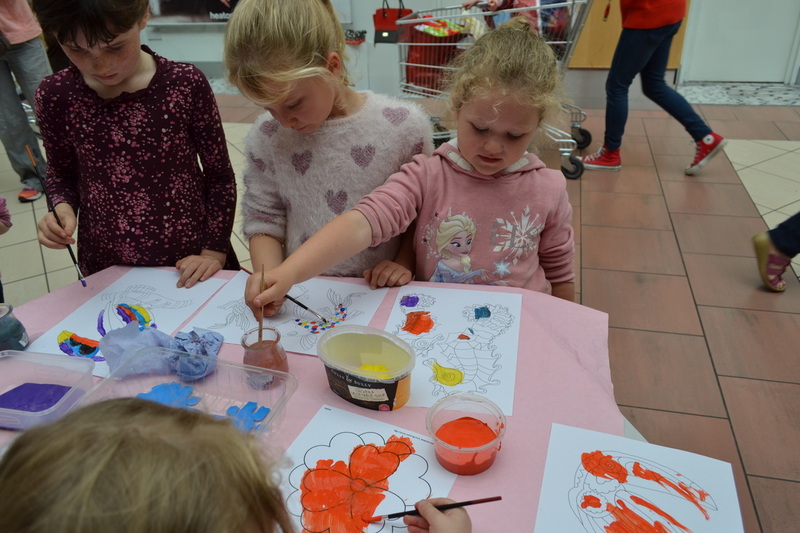 We were also really interested to find she has peared everything back down to the basics and uses just 3 colours and white to make all she needs. 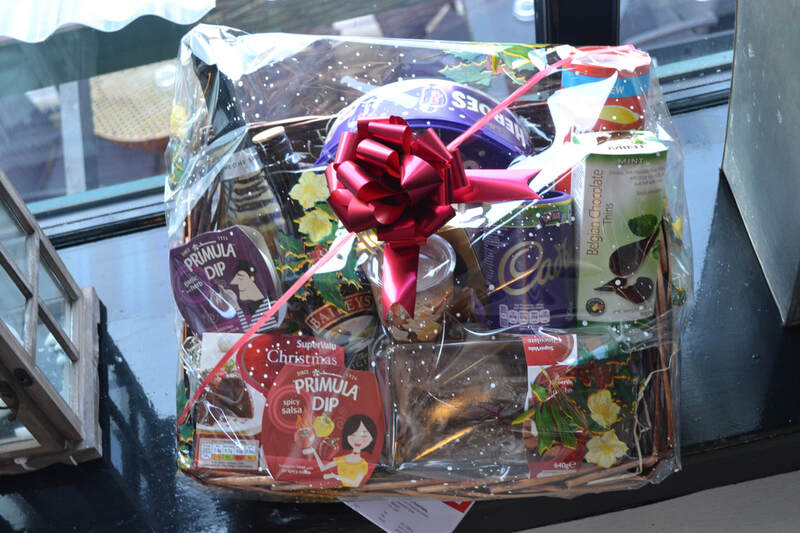 It looks like we will have to take on the challenge and spend some time soon doing just that- should be fun ! 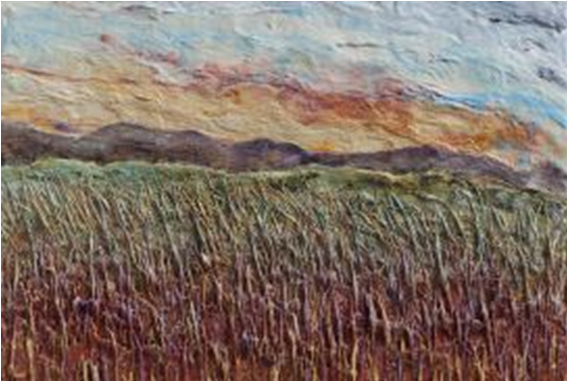 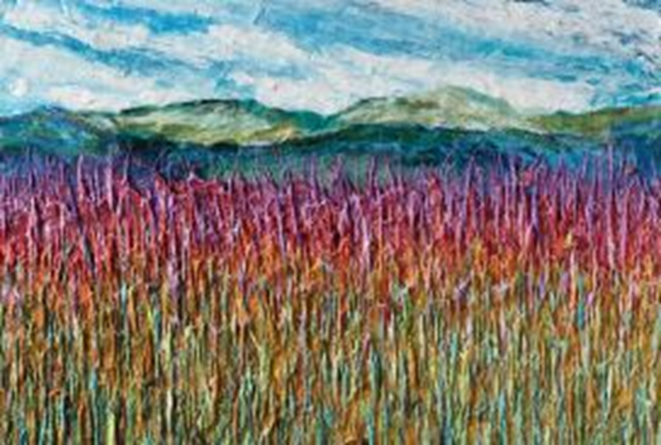 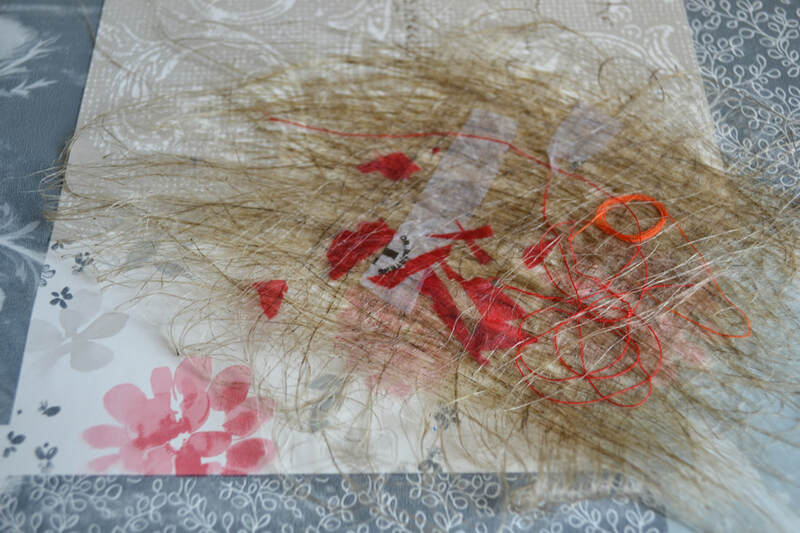 We were all fascinated with her unusual use of handmade paper to create her very individual textured pieces. 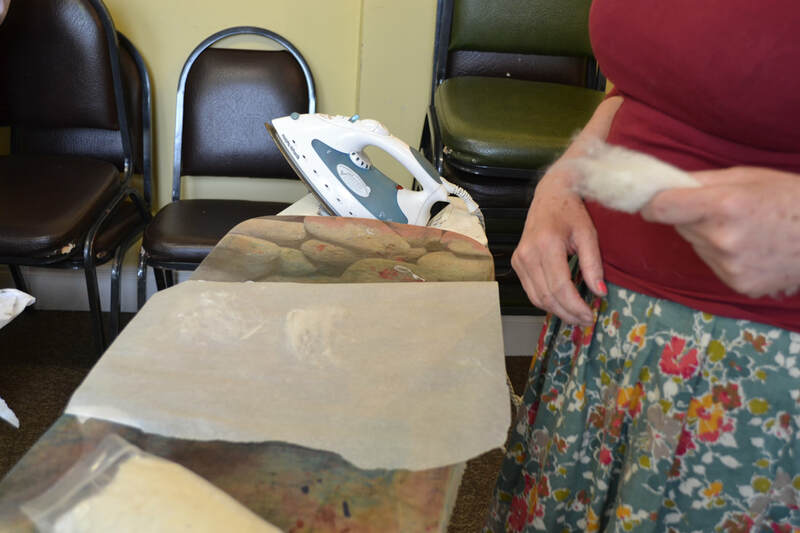 Hilary has developed this technique herself based on lots experimentation until she got these great results. 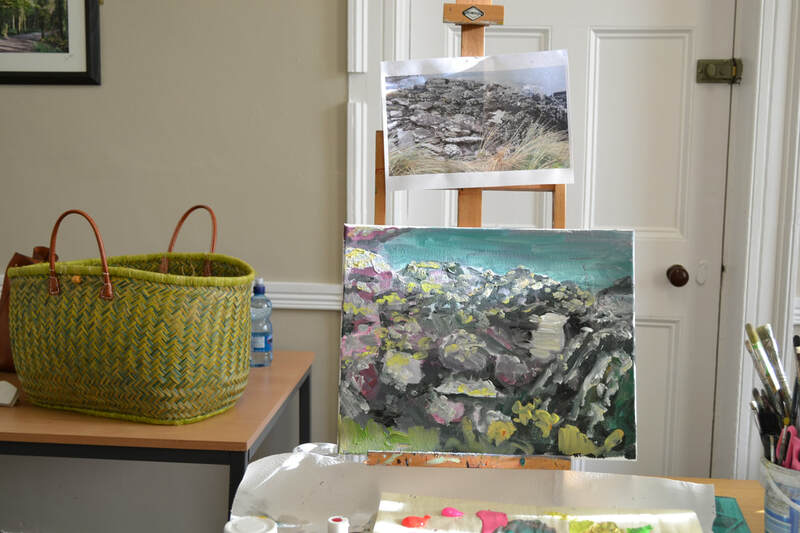 Some examples of Hilary's work.